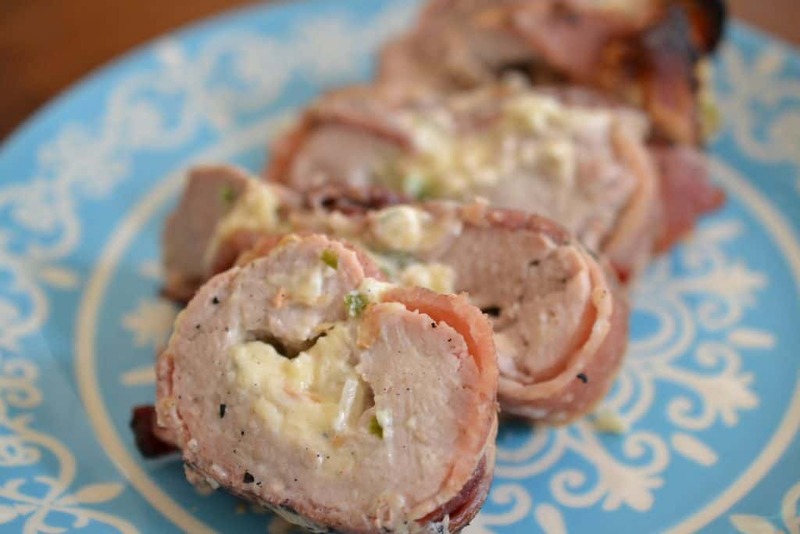 Pork Tenderloin is even better when it is stuffed and wrapped in bacon. Just the perfect recipe for that late night supper on Saturday evening with a nice bottle of wine. 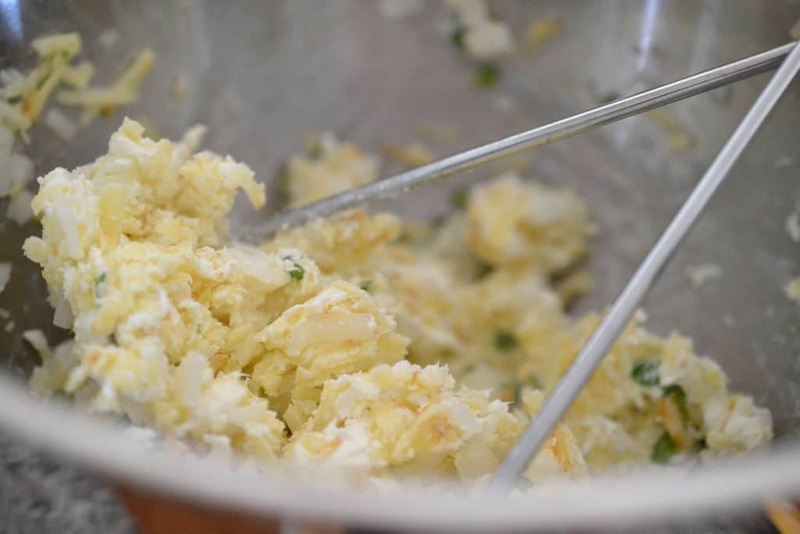 Mix the Serrano pepper, onion, cream cheese, garlic powder, onion powder and Gruyere cheese in small bowl. An old fashioned potato smasher works well. Filet the pork tenderloin and beat with a meat tenderizing mallet. Spread the cream cheese mixture down the middle. Pull the meat up and around the cream cheese mixture. 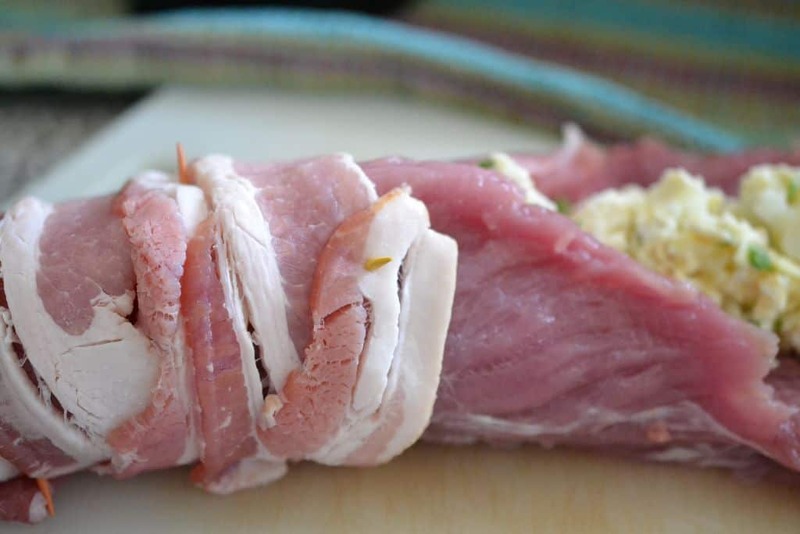 Wrap the tenderloin in pieces of bacon and secure with toothpicks. Grill it on indirect heat until the bacon is a nice golden brown. 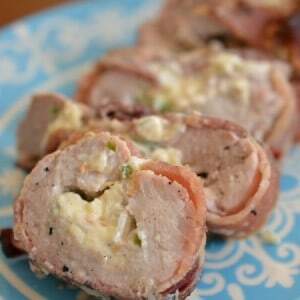 Allow the pork tenderloin to rest for about 15-20 minutes before serving. Cover loosely with foil. Enjoy!! Goes great with a nice spinach salad. Mix the Serrano pepper, onion, cream cheese, garlic powder, onion powder and Gruyere cheese in a medium bowl until well combined. Trim any fat from meat. Using a sharp knife, make a lengthwise cut down the center of roast, cutting to, but not through, the other side. Place tenderloin between 2 sheets of plastic wrap and pound meat lightly with the flat side of a meat mallet to about a 12×6-inch rectangle. 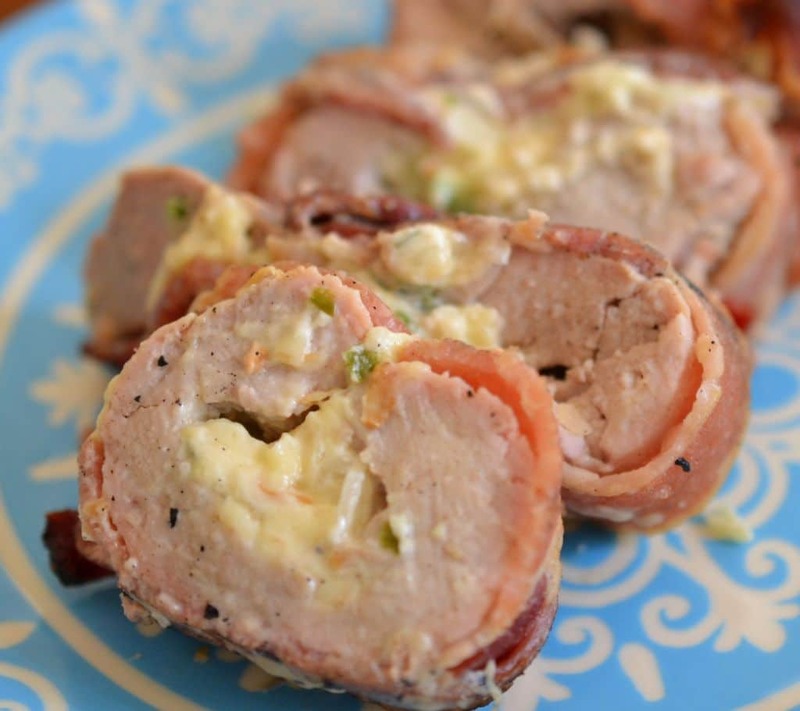 Spoon the cream cheese mixture down the center of the pork. Pull the sides up and around the cream cheese mixture. 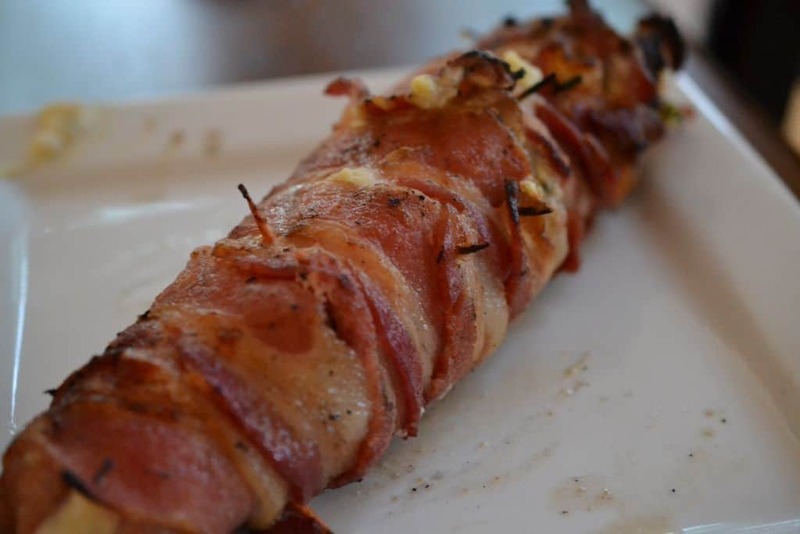 Wrap the uncooked bacon around the width of the meat and secure with a toothpick. 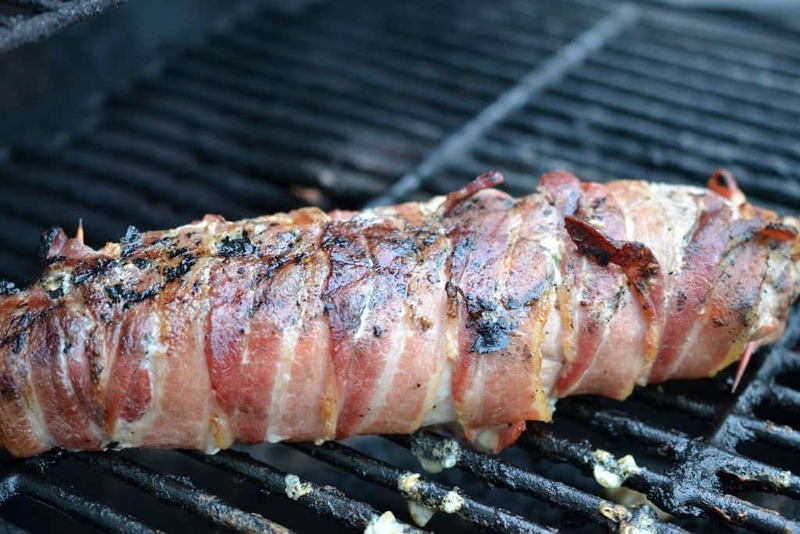 Continue until all the tenderloin is wrapped in bacon. Cook on the grill on indirect heat until the bacon is golden brown. Allow to rest for 15-20 minutes before removing toothpicks and slicing. 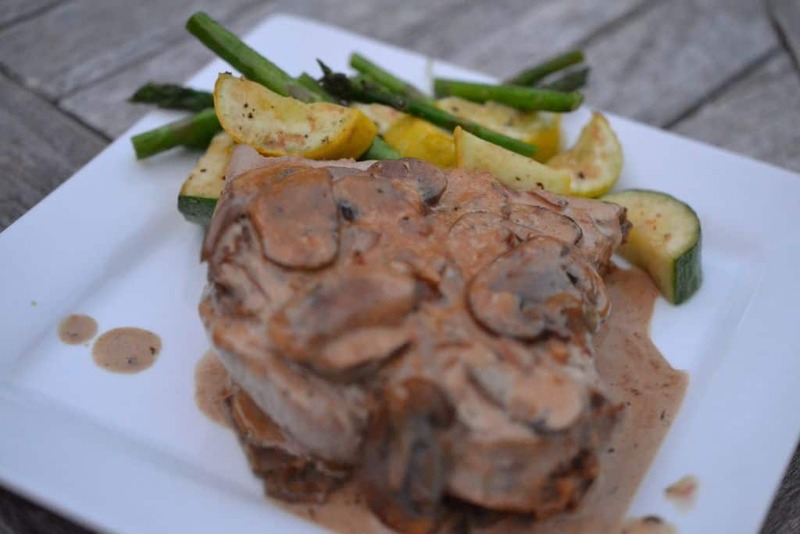 What a beautiful evening for some chops with a brandy cream sauce. 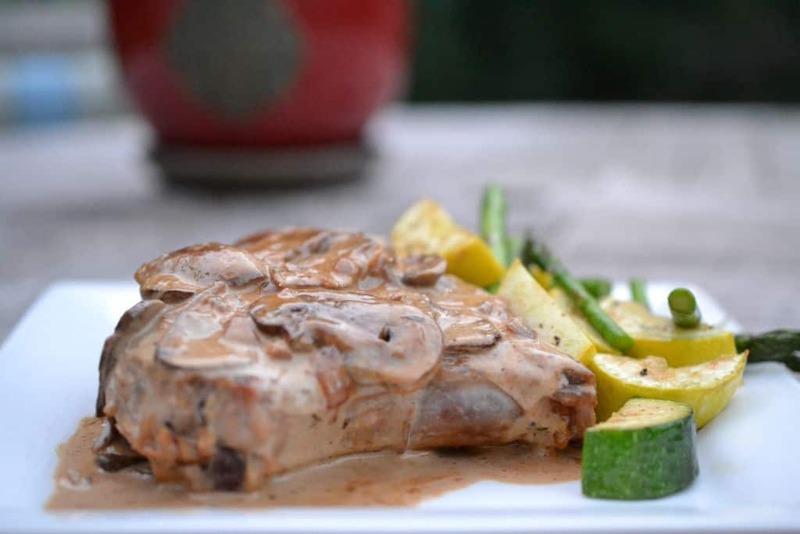 Now it is absolutely imperative that you start with some good quality pork chops. I hope you have a butcher shop in your neck of the woods that has good quality meat. Combine the vinegar, olive oil, soy sauce, onion powder and garlic powder in a Ziploc and throw those pork chops in. Allow to marinate at least a couple of hours up to overnight in the refrigerator or icebox as we call it here in the Midwest. 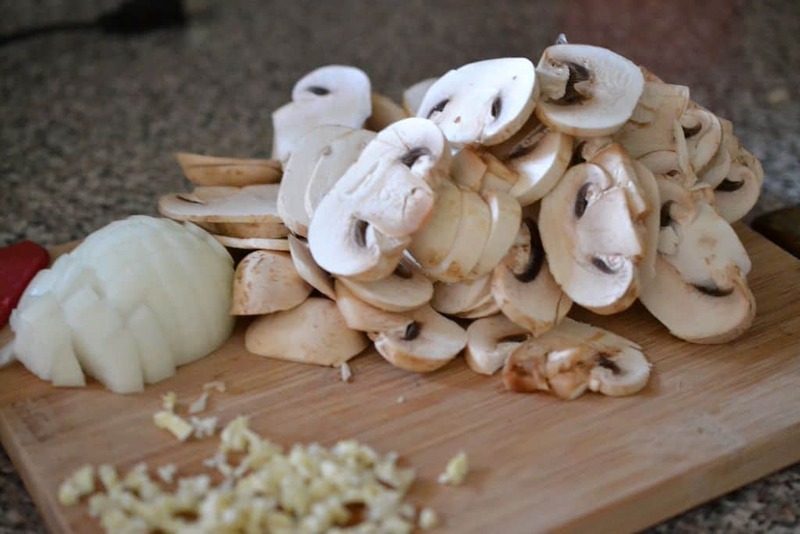 You will need some mushrooms, onion and garlic. 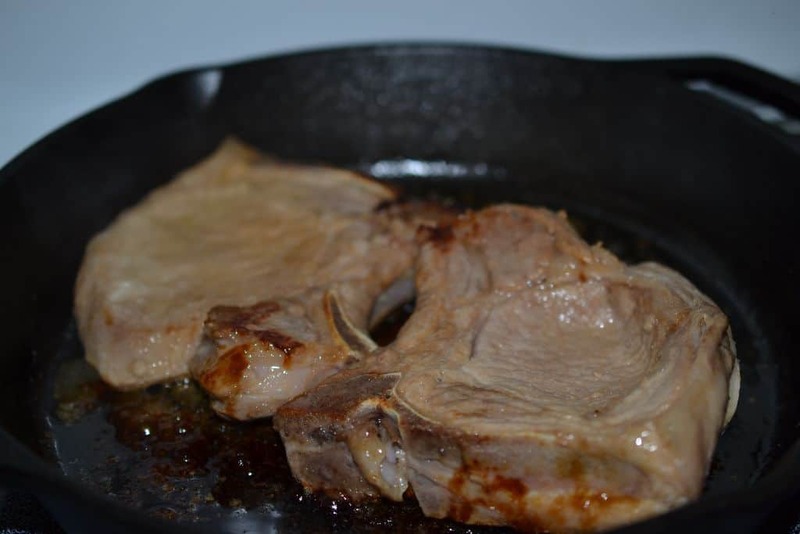 Put a little butter and some olive oil in a cast iron skillet and cook those pork chops on medium high heat for about 4 minutes each side. Remove from pan, cover and keep warm. Do not wash that pan just yet. Loosen any goodies on the bottom. Lower the heat to medium and throw in the mushrooms and the onion. Saute those mushrooms and onions until they are nice and golden. Add the garlic and saute for another minute or two. Add the brandy and cook down to about half on medium low heat. Add the cream, thyme, Dijon mustard and cayenne pepper. Mix gently and cook over low heat for about five minutes. If it seem like it is getting too thick add a tablespoon of brandy. You can thank me later. Enjoy the wonderful creaminess of this dish. I know I will! 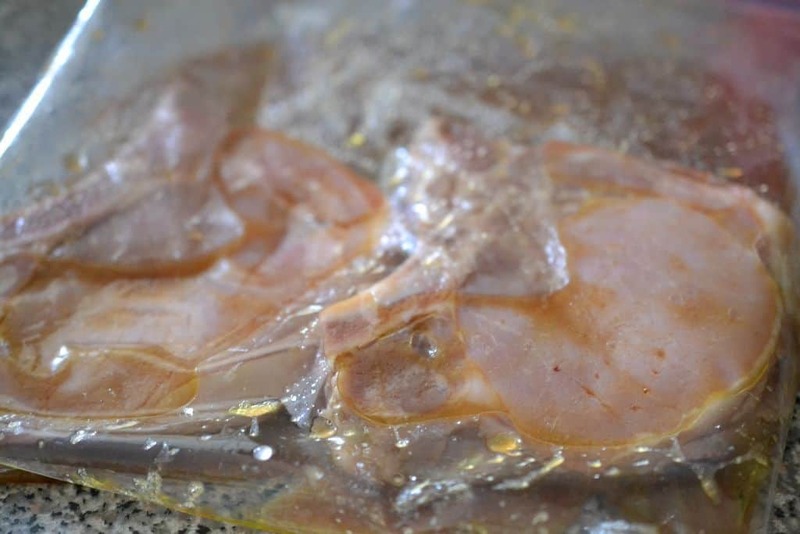 Combine the first five ingredients for the marinade in a large plastic ziploc bag. Add the pork chops and marinade for at least two hours up to overnight. Add the butter and one tablespoon of olive oil to a cast iron skillet. Cook the pork chops on medium high heat for 4 minutes each side. Remove, cover and keep warm. Add the remaining tablespoon of olive oil. 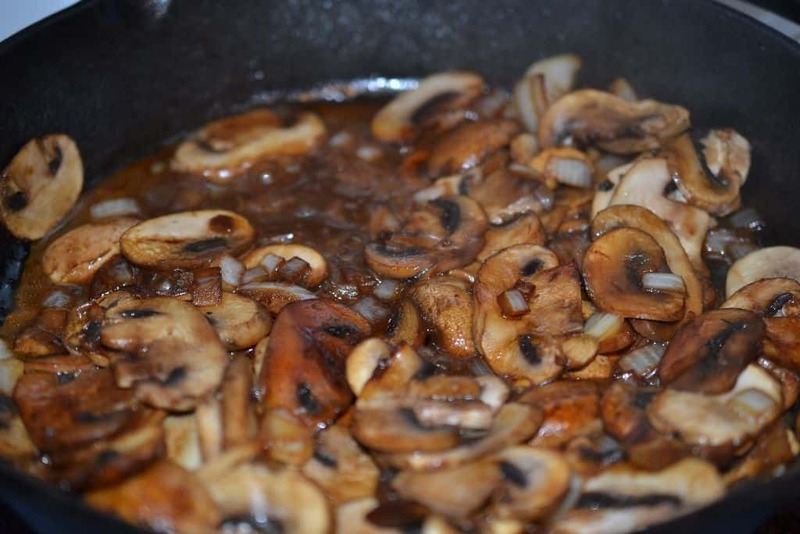 Loosen the brown bits on the bottom of the pan, add the mushrooms and onions and cook until golden brown. Lower the heat to medium low and add the garlic. Cook for another minute or two. Add the brandy and reduce by half. Add the cream, dried thyme, Dijon mustard and cayenne pepper. Allow to cook for about five minutes on low. Add the pork, ladle the sauce on top and allow to cook for another minute or two. 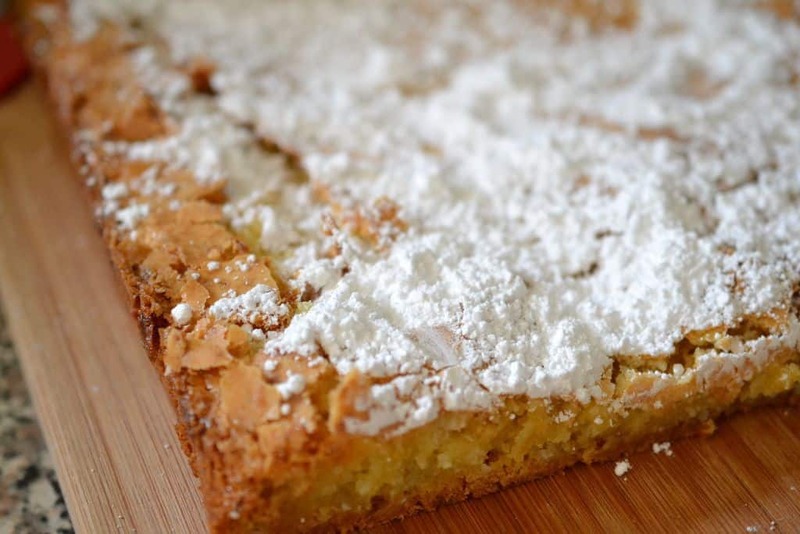 If you have never tried a Gooey Butter Cake you must really treat yourself!! This is one of those regional recipes. It is a St. Louis original recipe or at least that is what I have always been told and I believe to be true. You will not be disappointed at all. You will fall madly in love with this recipe. Preheat the oven to 350 degrees. 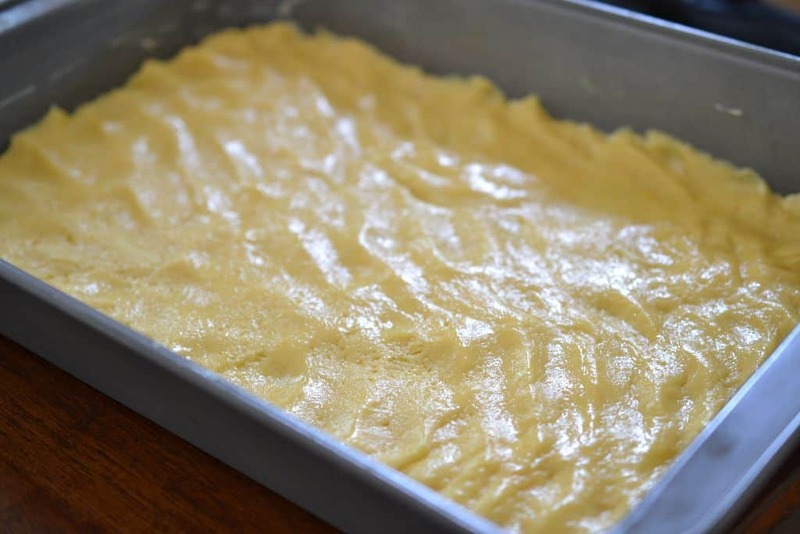 Butter one 9×13 inch cake pan. 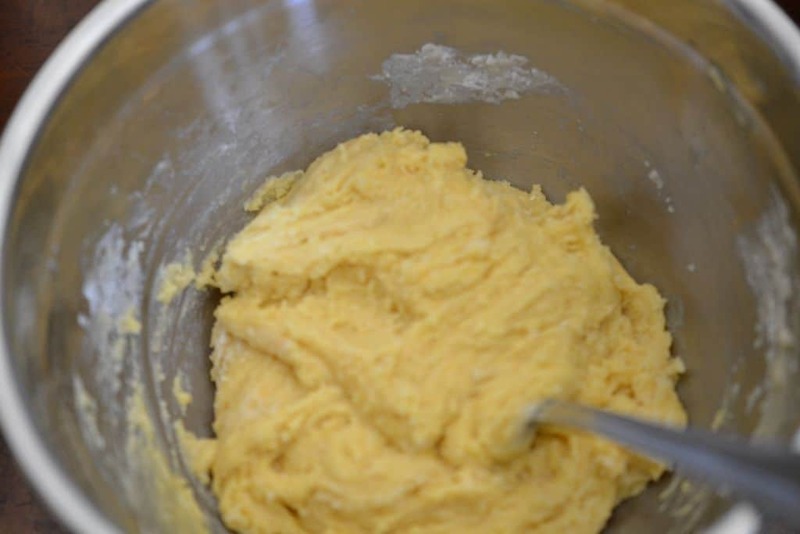 Mix the cake mix, melted butter and one egg in a medium size bowl. Pat gently into the bottom of the pan. Set aside while you make the top layer. Mix the remaining two eggs with the cream cheese, vanilla and the powdered sugar. Pour over the top of the bottom crust. Do NOT mix the layers together. Bake for 40-45 minutes. Wait until completely cool to cut. 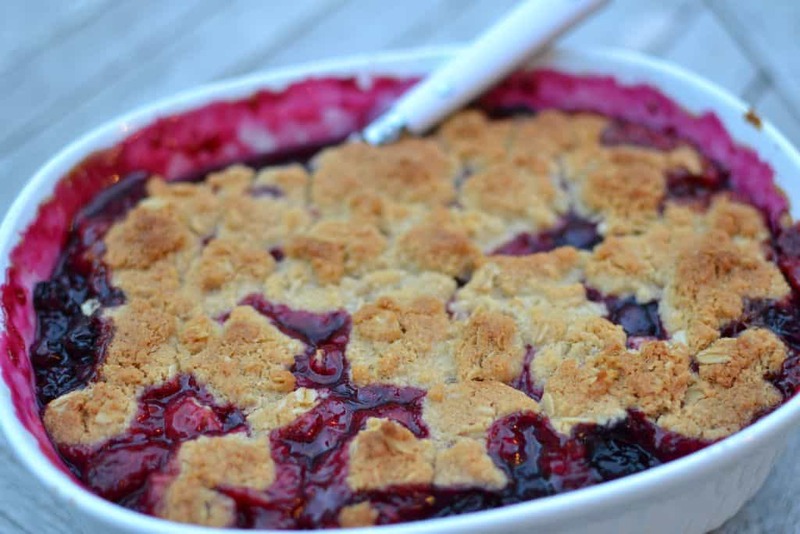 Doesn’t it look delicious and it is as easy as pie!! 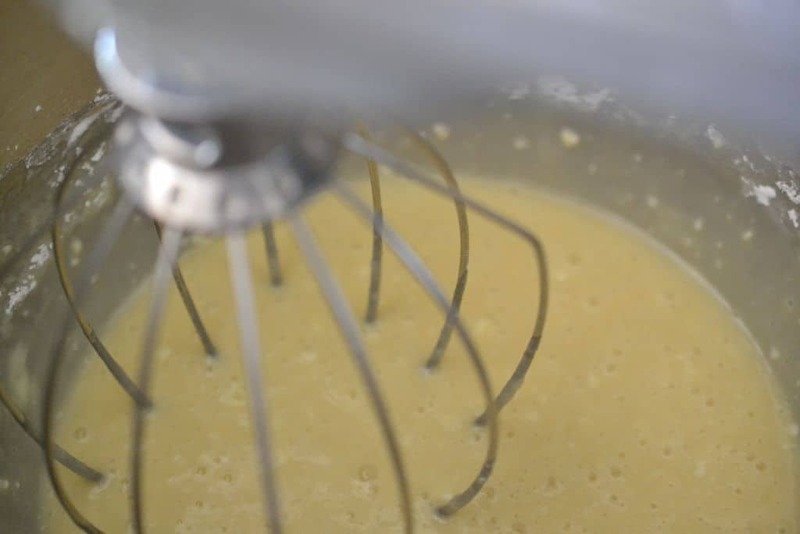 Mix cake mix, melted butter and one egg. Pat gently into the bottom of the pan with your clean fingers. 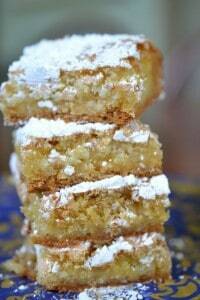 Mix cream cheese, vanilla, 2 eggs and powdered sugar with hand or stand mixer until well blended. Pour on top of the bottom layer. Do NOT mix the two layers together. Bake for 40-45 minutes until golden brown. 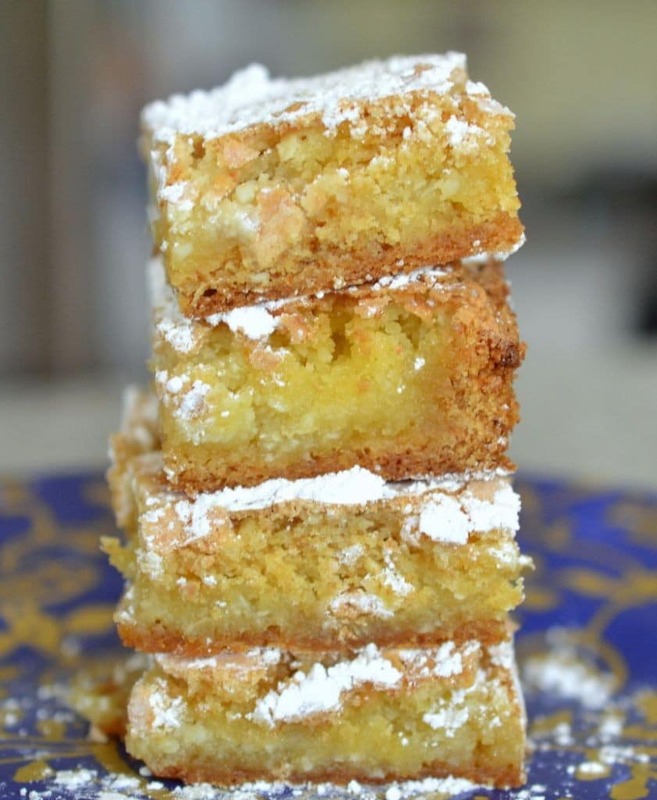 These are delicious and relatively easy to make. I borrowed my neighbors pan because I wanted to see if I want to purchase one for myself. I was not sure that my little treats would not stick so I made a few in the standard cupcake wrapper which I removed after cooking and cooling. 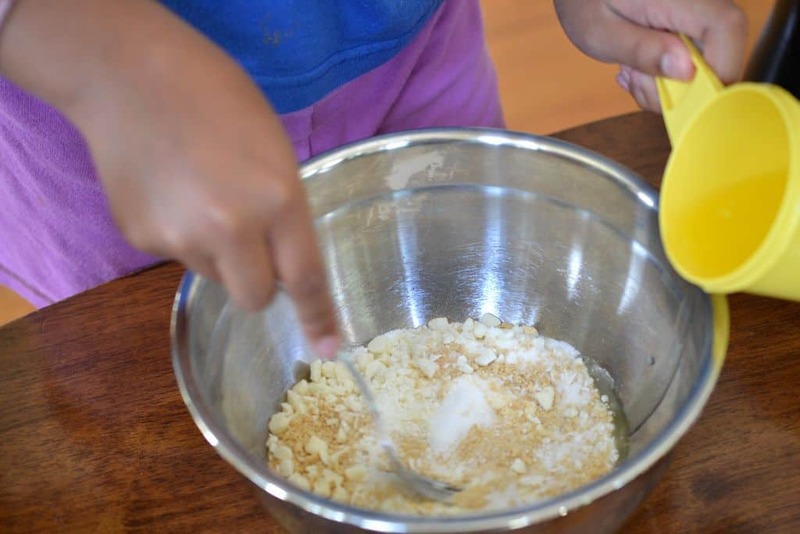 Combine the graham crackers, chopped white chocolate and sugar in a small bowl. Here is Melissa’s pan that I am testing. Each one of these slots has a removable bottom. So when the little cakes are done you can push them up through the hole. You will need to grease this very well…. especially the bottoms as we had trouble with a few of the bottoms sticking. Combine the melted butter and canola oil. Blend in to the graham cracker mixture. It should look like this when you are done combining. Add a small spoonful of the graham cracker mixture to each hole and press lightly to form a crust on the bottom. Bake the crusts for 5 minutes at 350 degrees. 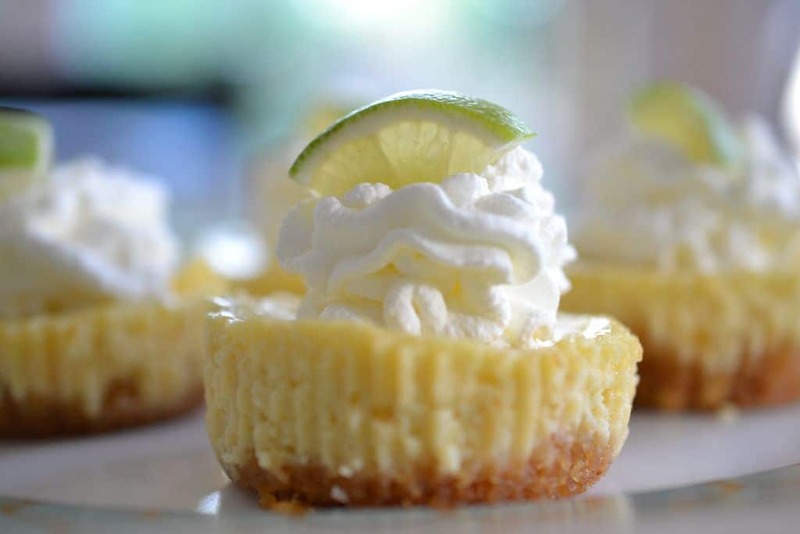 Blend the lime juice, grated lime peel and Greek Yogurt for 1- 2 minutes. Add the egg yolks and sweetened condensed milk then mix 1-2 more minutes. Ladle the mixture into the pan on top of the tiny crusts and bake at 350 degrees for 15 minutes. After cooking they will need to be chilled in the icebox for at least several hours. Overnight would even be better. 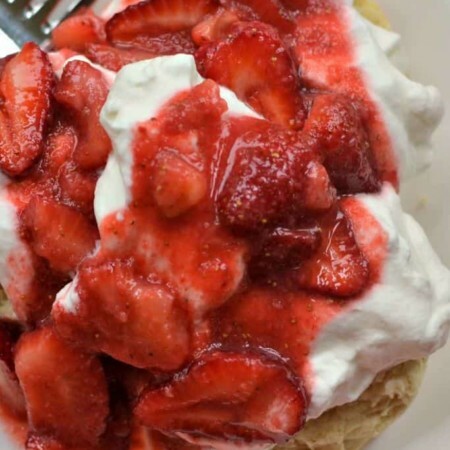 Place the whip cream and sugar in a mixing bowl and mix until stiff peaks form. Put the whipped cream in a pastry decorating bag. I like the disposable ones because then I can just pitch it when I am through. 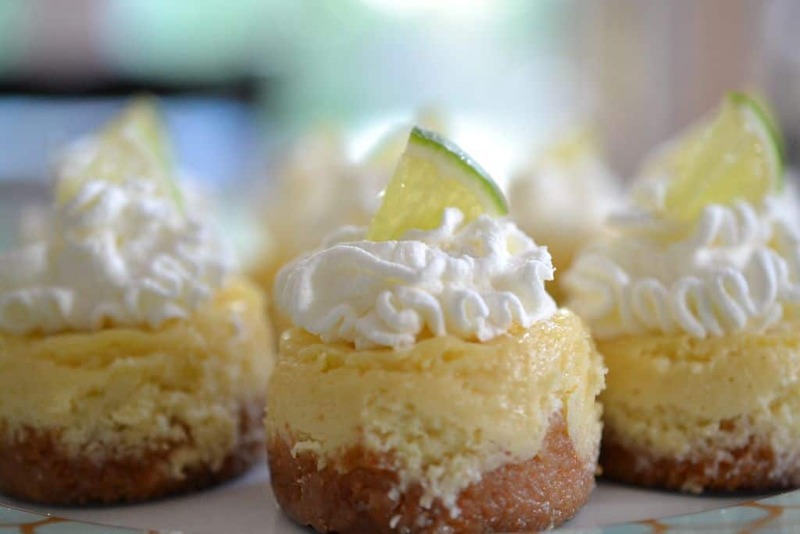 Top each cake with the whipped topping like frosting on a cupcake and top with a tiny slice of lime. Here is how they turned out in Melissa’s pan. Here are the ones in the cupcake wrappers. You just remove the cupcake wrappers after they have cooled in the icebox. 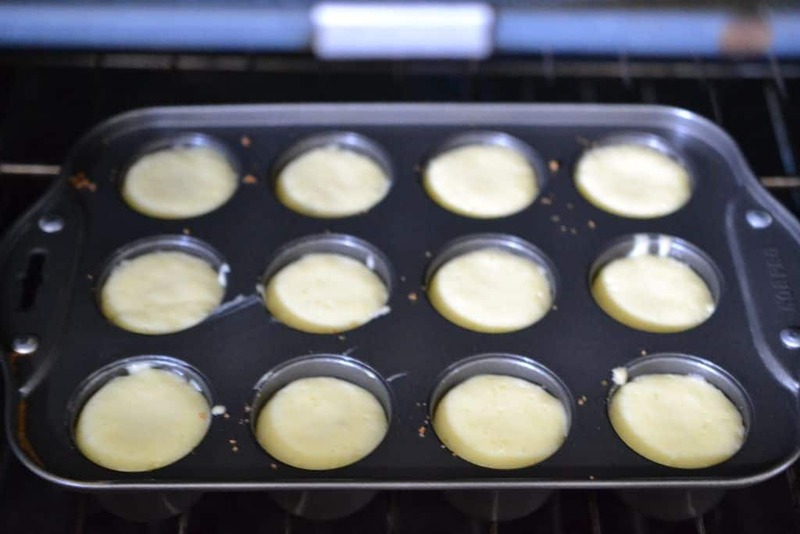 Preheat oven to 350 degrees and grease the Norpro deluxe mini cheesecake pan very well or use a standard cupcake pan with cupcake liners. 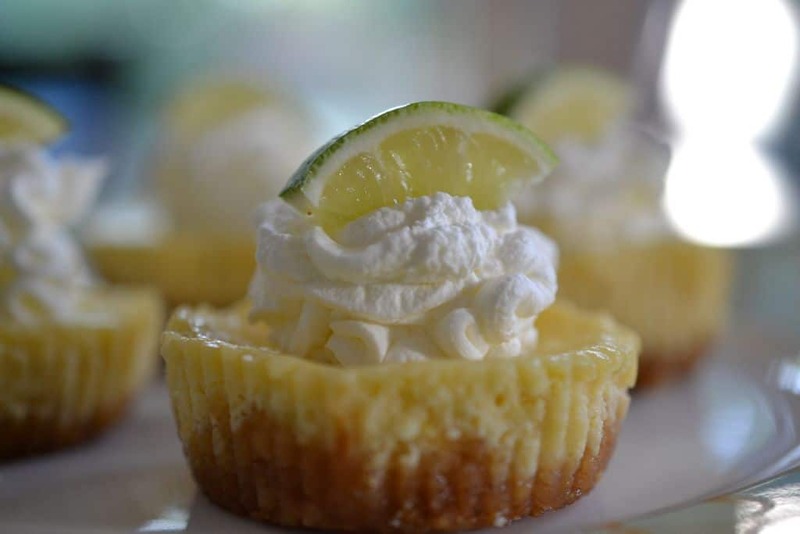 If you choose to use the cupcake liners spray them lightly with a nonstick spray. 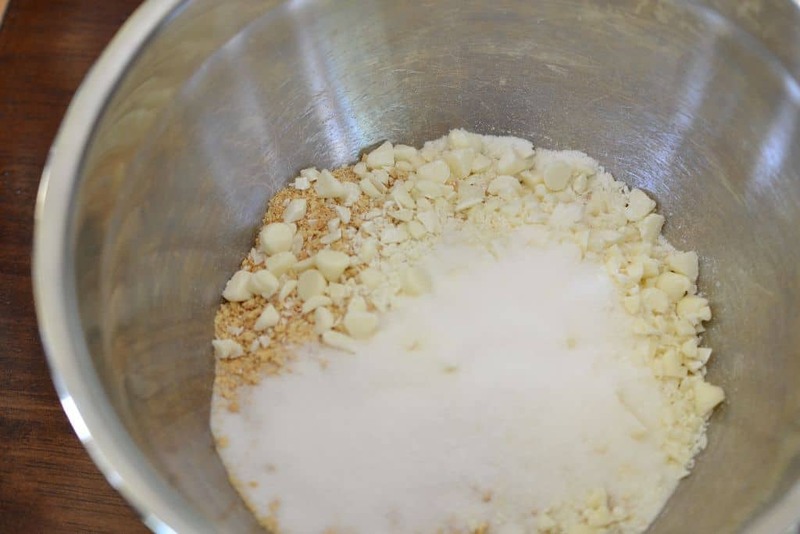 Combine the graham crackers, white chocolate and sugar in a small bowl. Combine the melted butter and canola oil. 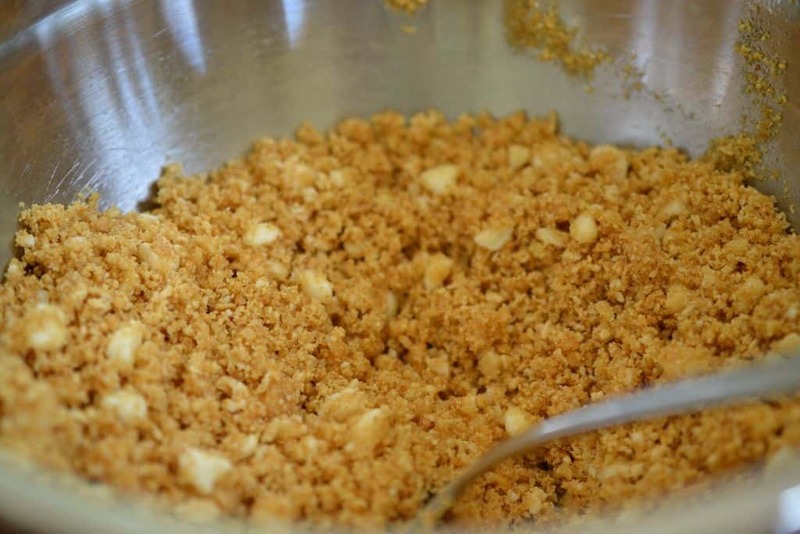 Add the butter mixture to the graham cracker mixture slowly while combining with a fork. 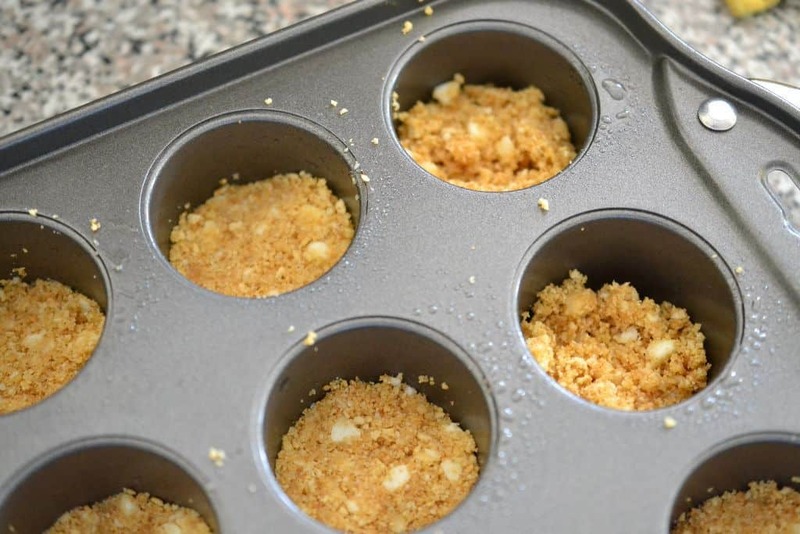 Using a small spoon place a spoonful of the graham cracker mixture in each hole or cupcake liner. Press down gently to form a crust. Pre-bake for five minutes. Remove from oven. Combine the lime juice, grated lime peel and Greek yogurt in a mixing bowl. Mix 1-2 minutes until combined. Add the eggs and condensed milk and mix for 1-2 more minutes. 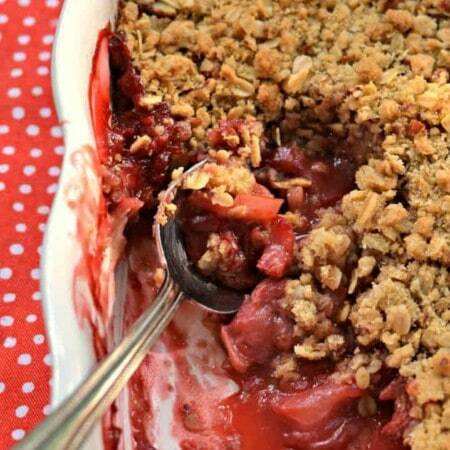 Ladle in to the holes on top of the graham cracker crust. Bake for fifteen minutes. Cool in the oven for several hours or overnight. Mix the whipped cream and the sugar in a prechilled bowl until stiff peaks form. Do not over-beat. Put the whipped cream in a decorating bag with the cupcake frosting tip. 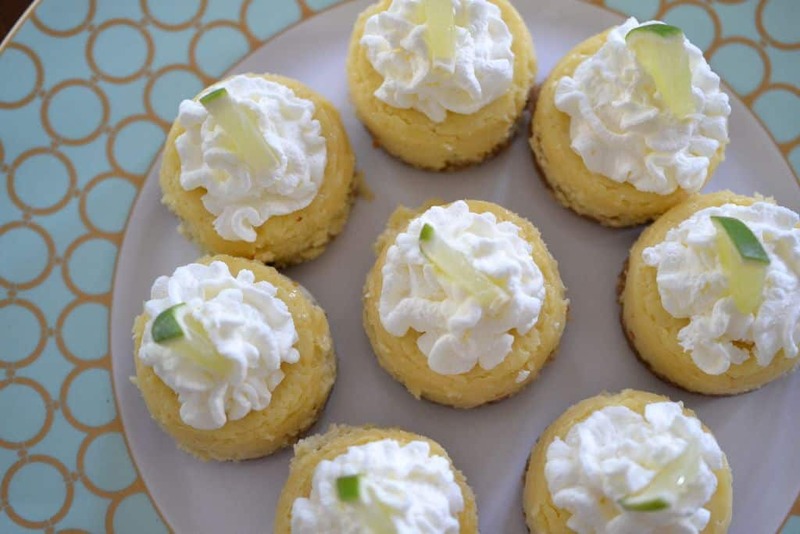 Frost the tiny cakes and decorate with tiny lime slices. The Norpro pan makes nice little cakes but they tend to stick to the little circles that they cook on. The cupcake wrappers also have a nice presentation albeit different but they are much easier to work with. These are super delicious and fun. The silly kids asked me why I was putting frosting on meatloaf. Seriously? My daughter even helped peel the potatoes. Kids can be clueless! Put a pot of peeled cut potatoes on the stove because we need some mashed potatoes. Combine the ground beef, breadcrumbs, egg, Worcestershire sauce, onion, marinara sauce, granulated garlic, black pepper, parsley, and onion powder in a big bad bowl. Mix until well combined. 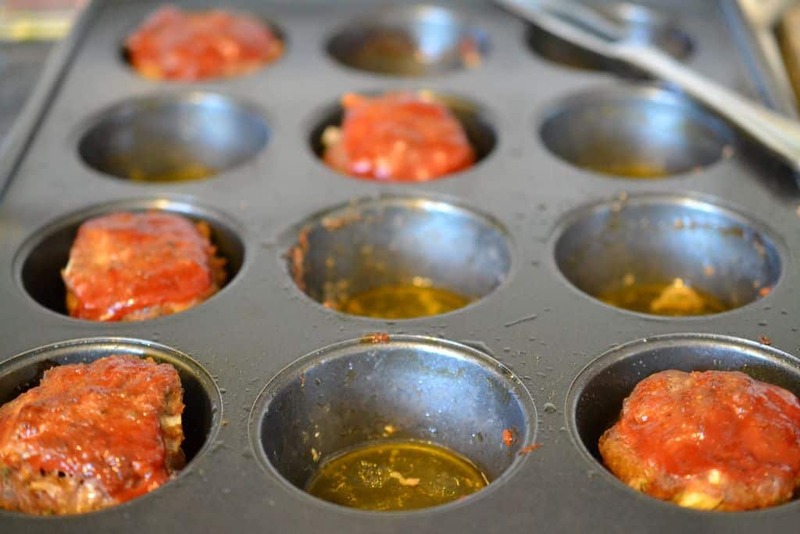 Press the hamburger mixture into a standard sized cupcake pan that has been coated with nonstick spray. 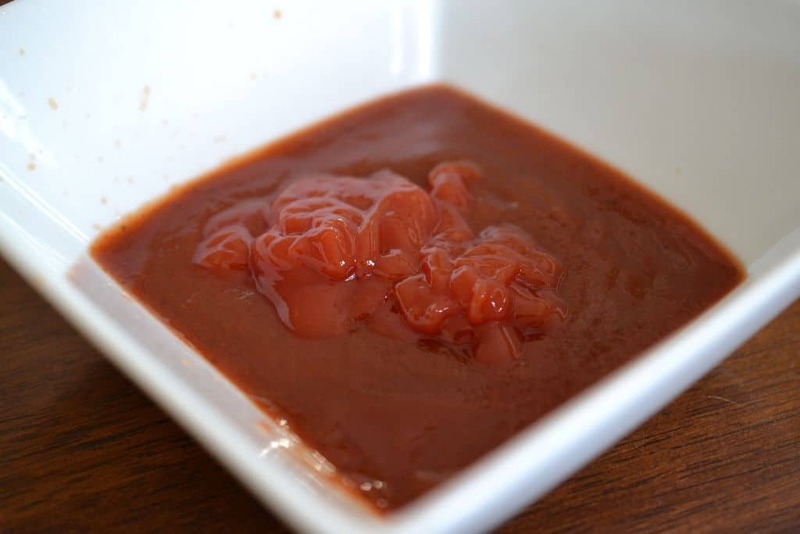 Combine 1/4 cup ketchup and 1/4 cup BBQ sauce in a small bowl. Spread the sauce over the meatloaf and put into a 350 degree oven for 35 minutes. Chop up 1/4 of a green pepper and chop up 1/4 of a red pepper. 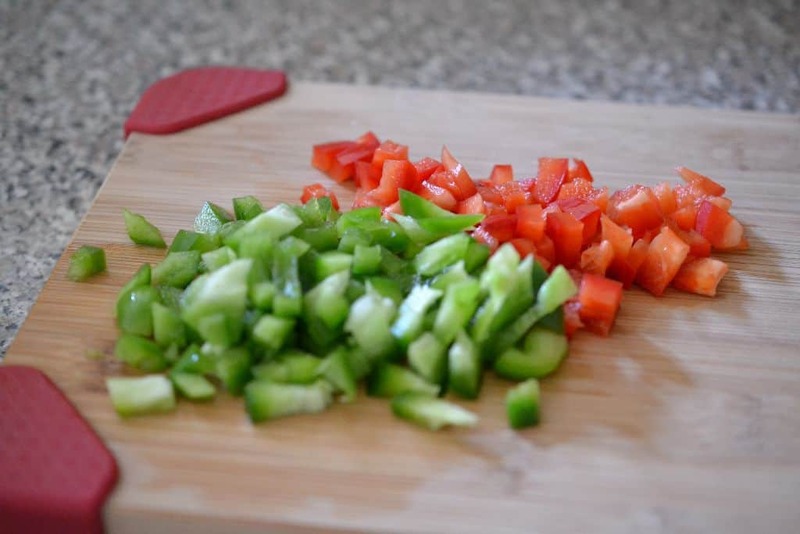 They must be really finely chopped….so when you think they are small enough do it again. Allow the meatloaves to cool for about ten minutes. Remove from pan and place on separate plate. You will notice that I only removed some of them. The sun is going down and all great food pictures are taken in natural light so I am trying to work fast. Saute those teeny weeny tiny peppers for about 3-4 minutes in a little olive oil. When potatoes are done drain the water being sure to get off all the excess. Add the butter, salt and pepper. Add the whipping cream and chicken broth to the saucepan a little at a time while mashing the potatoes with a mix-master or stand mixer. You will want a stiff consistency yet make sure to work it up pretty good with the mixer so it will feed through the pastry bag. 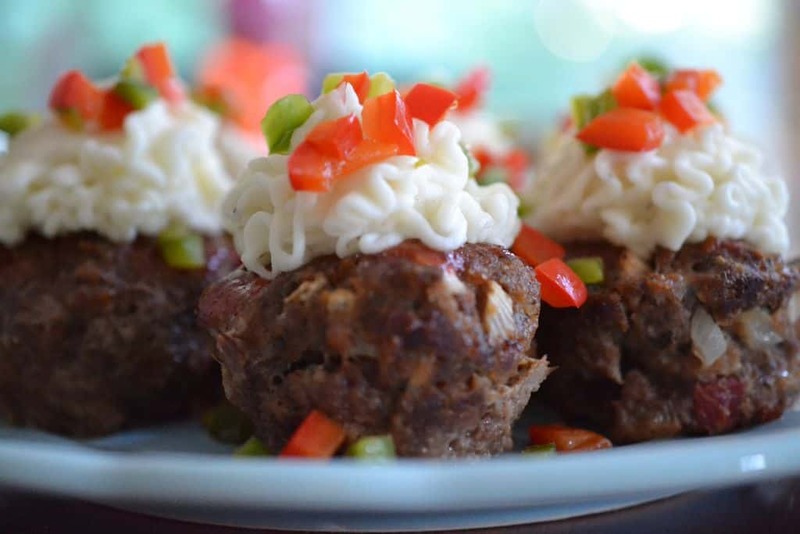 Load them into a pastry bag and spread them like frosting on the cupcake meatloaves. Sprinkle the green and red peppers on top of the potatoes. Enjoy your special little creations! 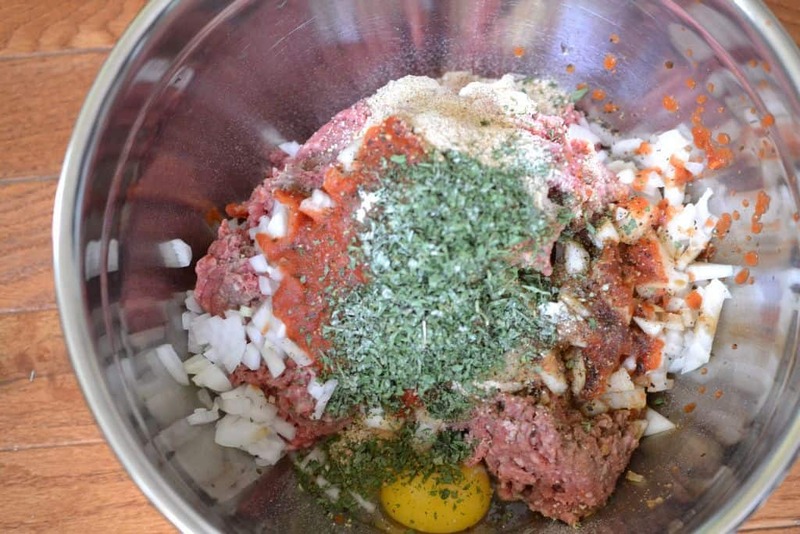 Mix the first ten ingredients together in a large mixing bowl (hamburger thru onion powder). Put the potatoes on the stove in a medium sized saucepan filled with water. Bring to low boil on medium low heat and cook until soft. 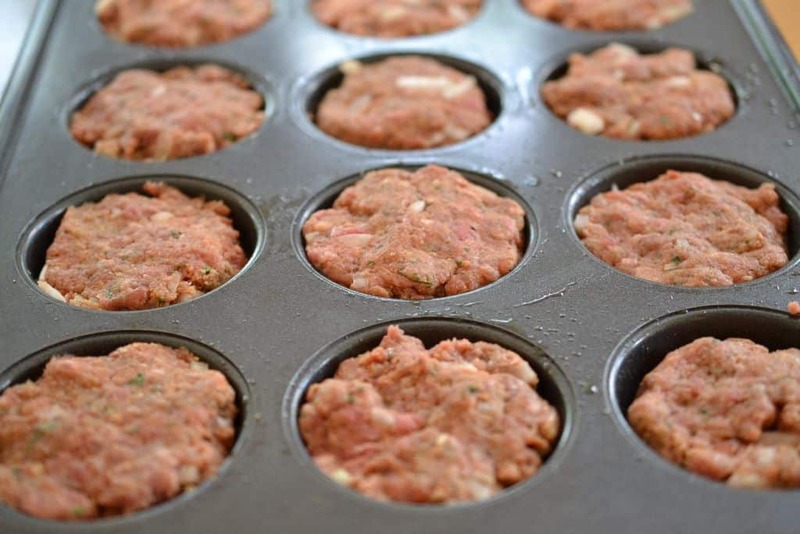 Fill a standard size 12 count cupcake pan with the ground beef mixture. Mix the ketchup and BBQ sauce in a separate small bowl. 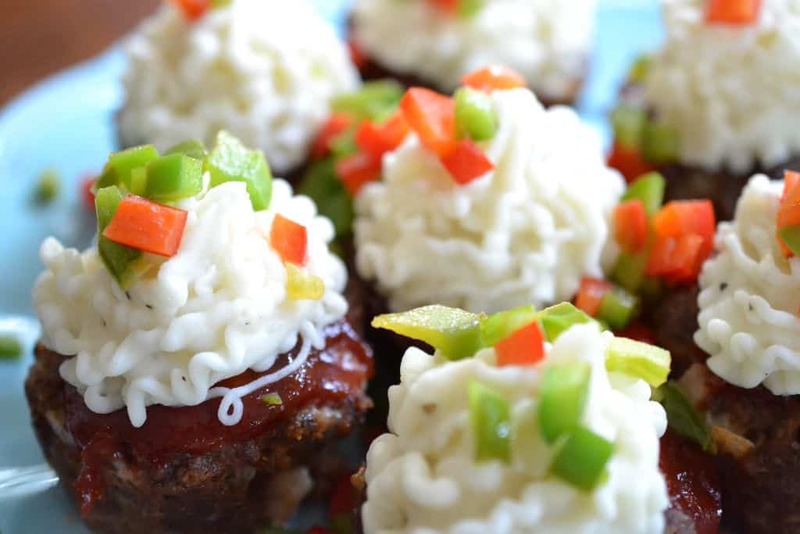 Spread a little on the top of each mini meatloaf. Cook the meatloaves for 35 minutes at 350 degrees. Remove from oven and allow to cool for 10 minutes. 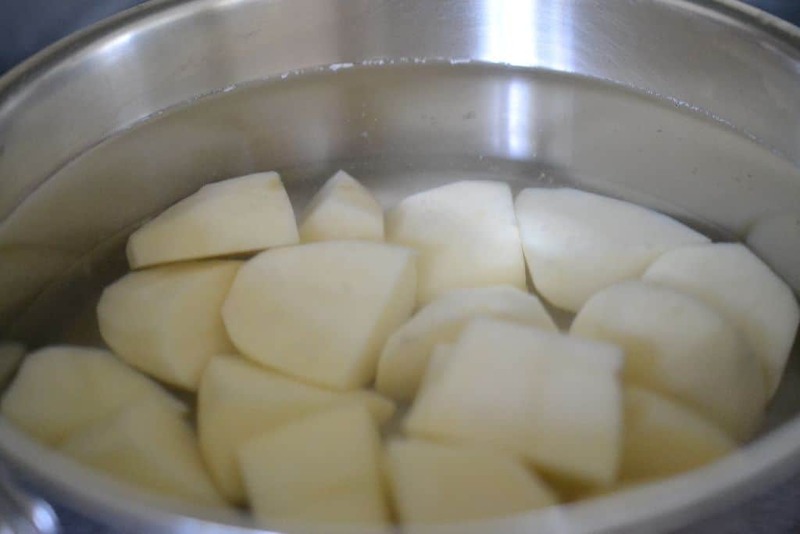 When potatoes are done drain the water making sure to get off all excess. Add the butter, salt and pepper. 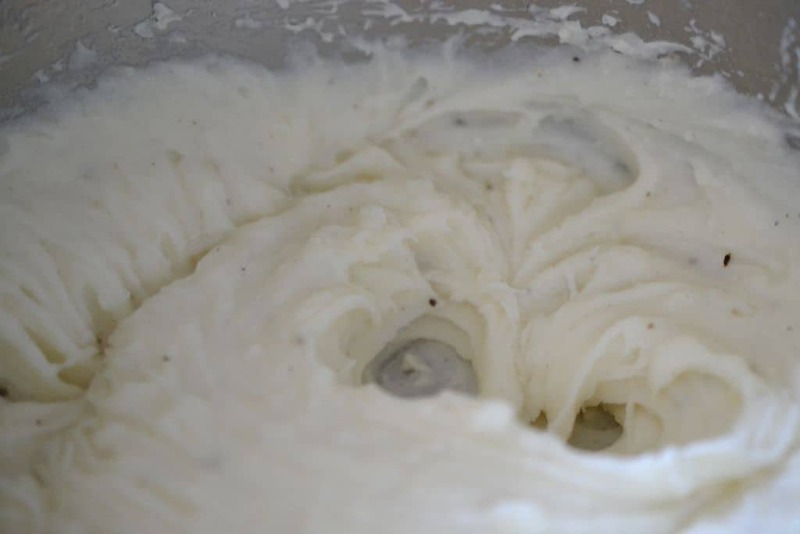 Add the whipping cream and chicken broth to the saucepan with the potatoes a little at a time while mashing the potatoes with a mix-master or a stand mixer. You will want a stiff consistency yet make sure to work it up pretty good with the mixer so it will feed through a pastry bag. 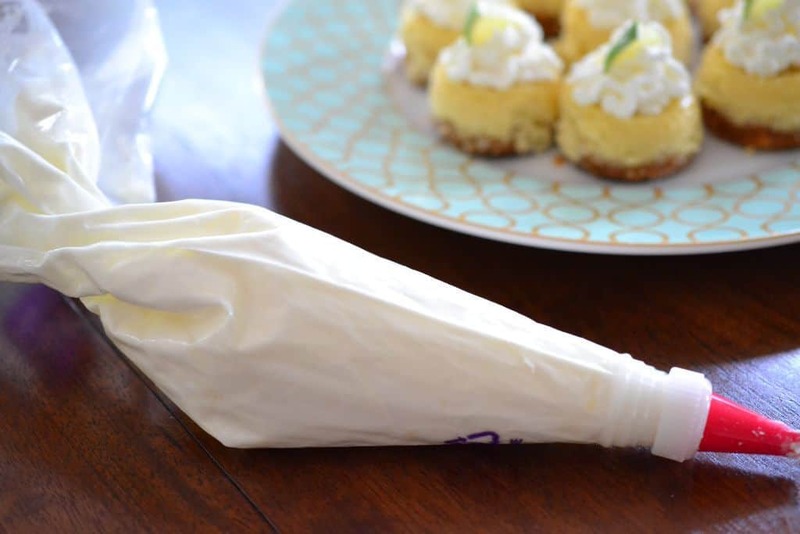 Load the pastry bag using your cupcake frosting attachment. Frost the meatloaves. Sprinkle the green and red peppers on top. 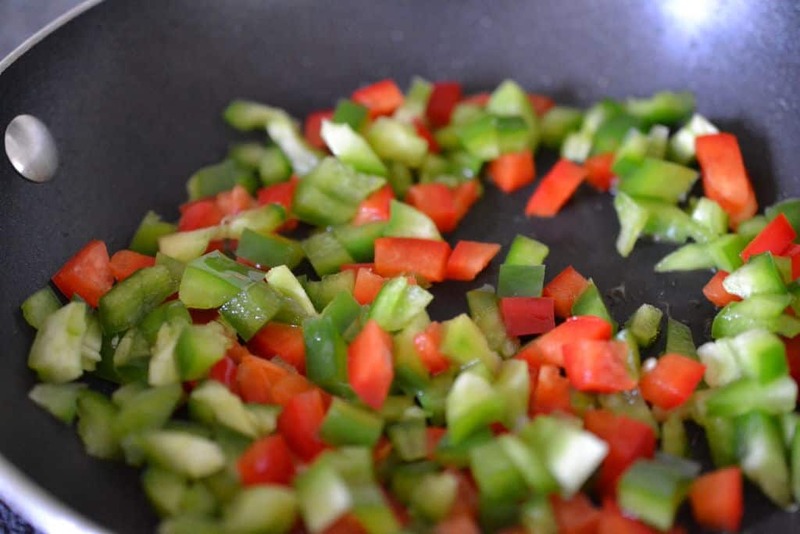 If you don’t like peppers you could use pine nuts, green onions, carrots or peas. Pizza has to be one of my absolute favorite foods in the whole wide world. 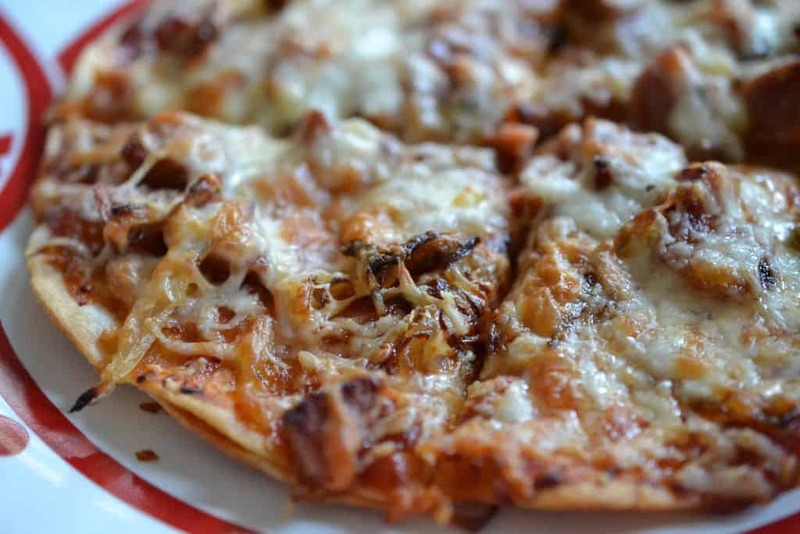 These pizzas are super easy to make and fantastically delicious! Cook the onion on low heat for a while and caramelize that puppy! It brings out all the sweetness and flavor and gives you time to work on your laundry. Turn the oven on 425 degrees. 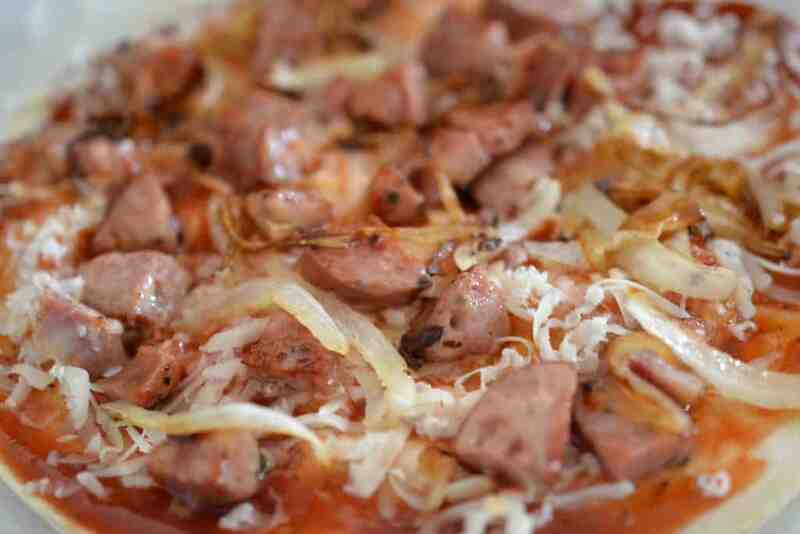 Throw the pizza stone in to preheat and then toss the sausage into the pan with the onion. 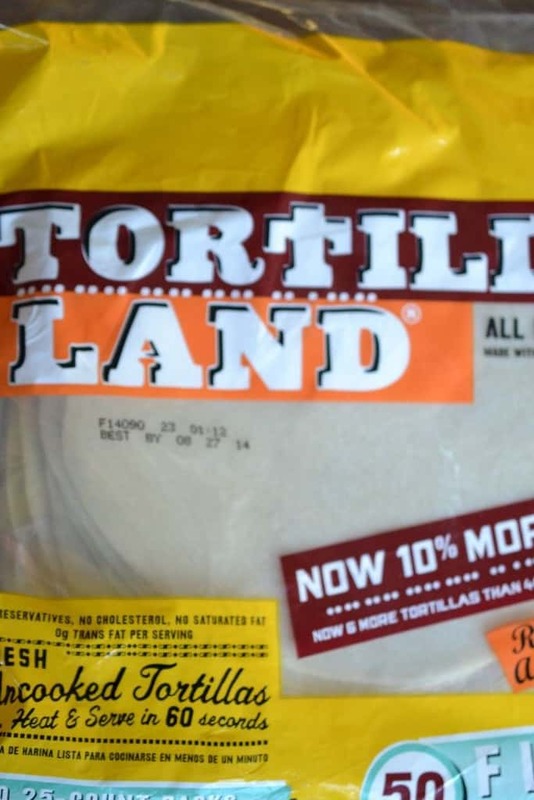 These are the most wonderful tortillas in the world. They are all natural and they make yummy thin crisp pizzas. Stack two together and throw them on the pizza stone for two minutes and then flip it and do two minutes on the other side. It may puff up like a pillow but just gently push on it with a spatula and it will flatten back out. 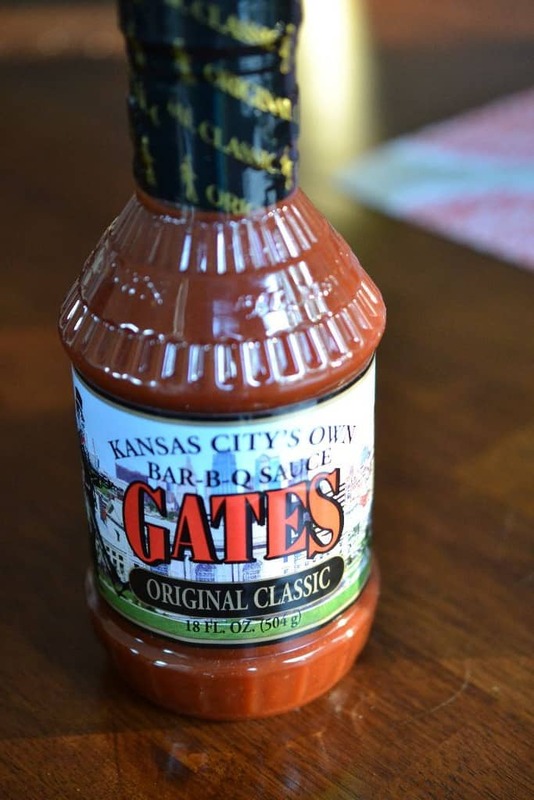 THIS IS THE MOST WONDERFUL BBQ SAUCE. I LOVE IT! I HOPE YOU CAN FIND IT IN YOUR FAVORITE STORE. YOU HAVE TO TRY IT! I HOPE I HAVE MADE MY POINT! Spread some BBQ sauce on that pre-crisped crust! Grate some cheese over the top of that sauce. I used white cheddar on bottom because I think it goes great with caramelized onions. 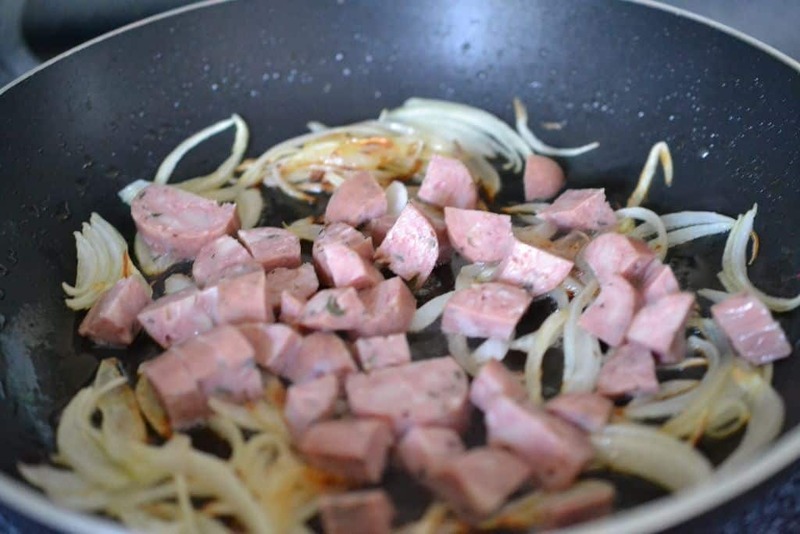 Add the onions and sausage. 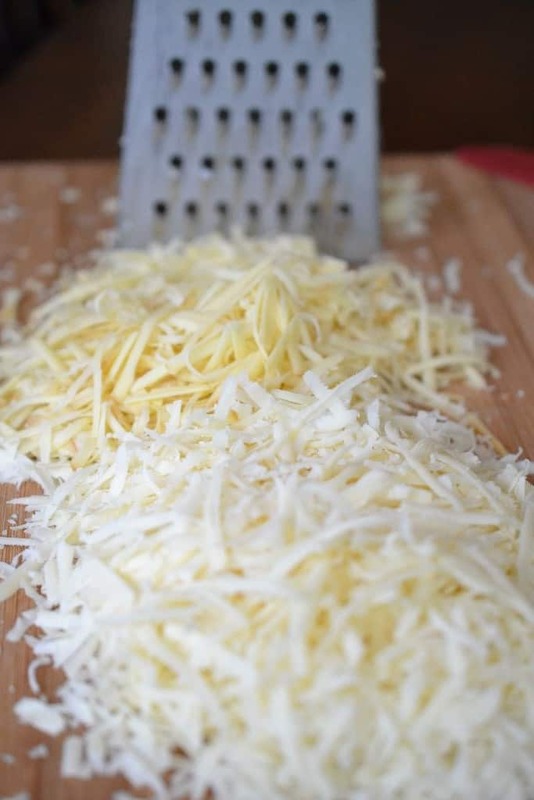 Shred another layer of cheese on top. I used mozzarella. Bake in the 425 degree oven for 8 minutes. 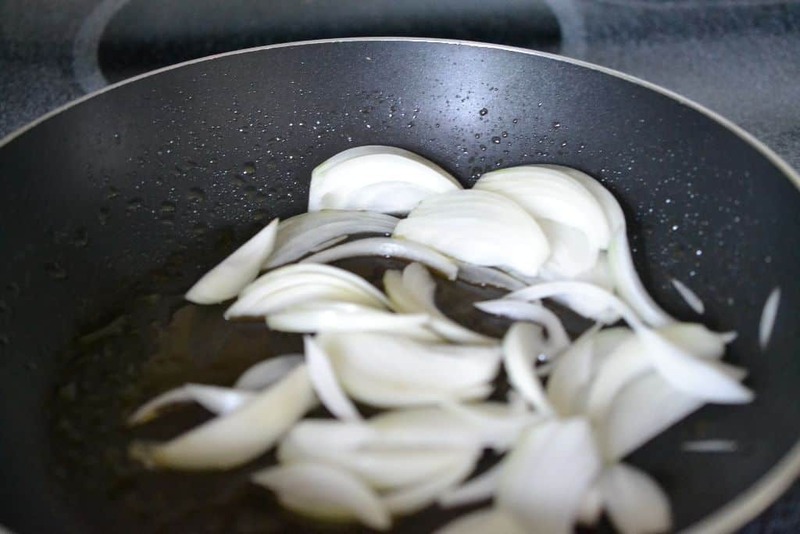 Add a tablespoon of olive oil to saute pan. Cook the onion on low heat for about 20-25 minutes. Adjust the heat up a touch and add the diced sausage link and cook for another 5-7 minutes. Preheat oven to 425 degrees and place pizza stone in the oven to preheat. Stack two tortillas on top of each other and place on top of the pizza stone. Cook two minutes on each side. 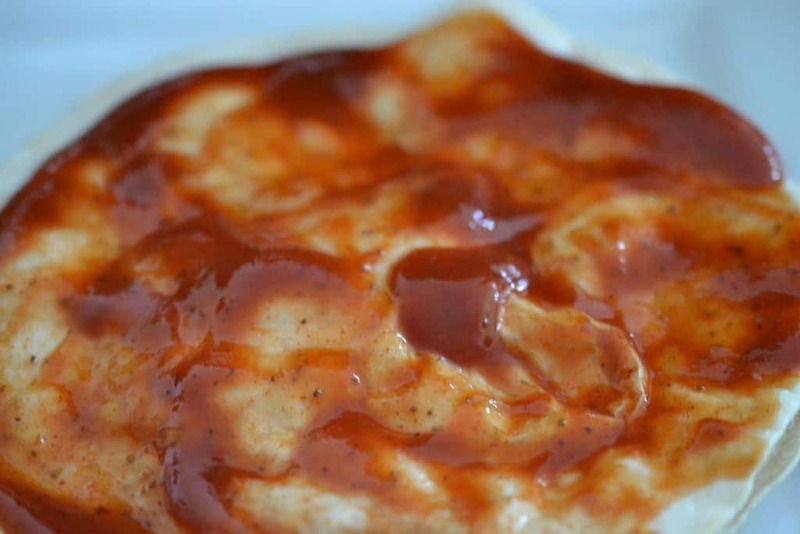 Spread the BBQ sauce on top of the tortillas. Add a layer of white cheddar cheese. Add 1/2 the cooked onions and sausage. Add a layer of mozzarella cheese and bake on the pizza stone for 8 minutes in the 425 degree preheated oven. 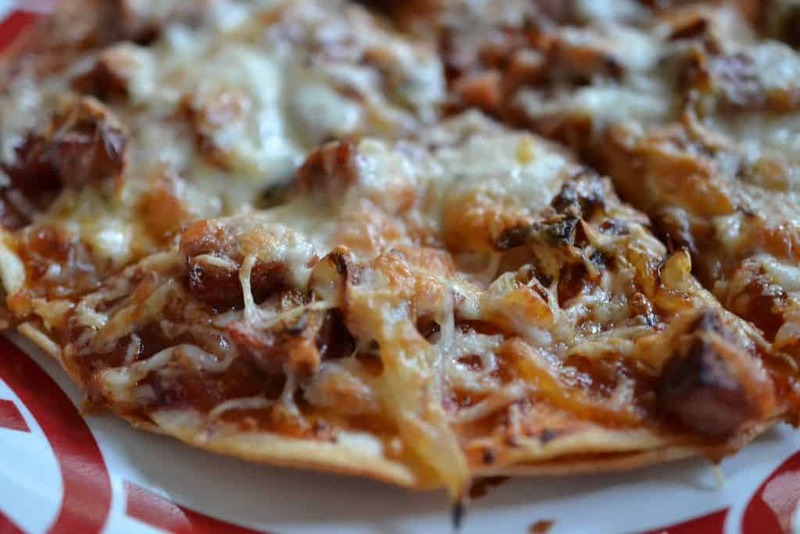 This recipe makes two small pizzas so adjust if necessary. 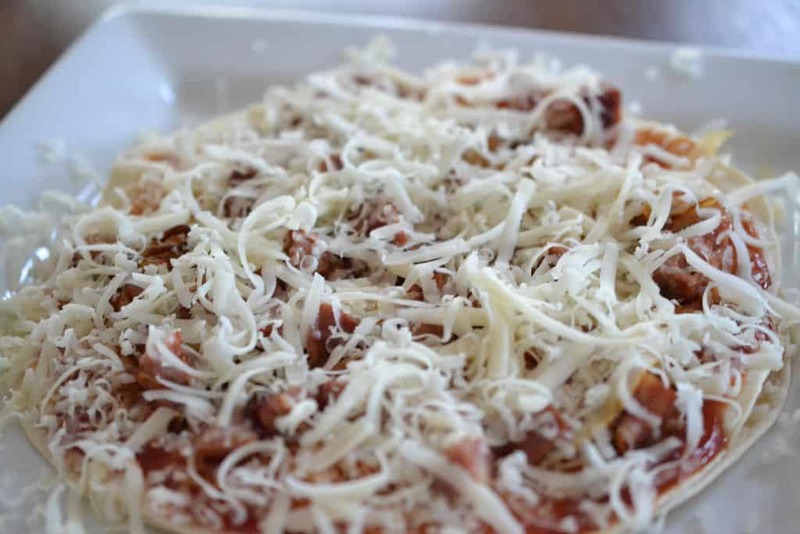 You can use whatever cheese pleases your palate but this is a great combination. 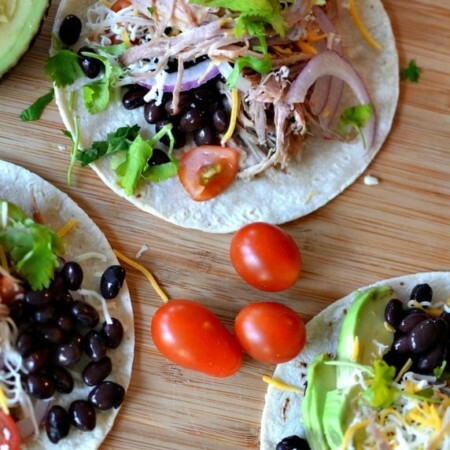 These are delicious and super easy to make. 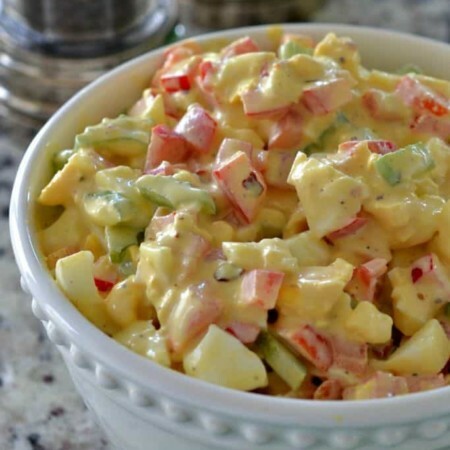 Perfect for that cocktail party or summer BBQ! 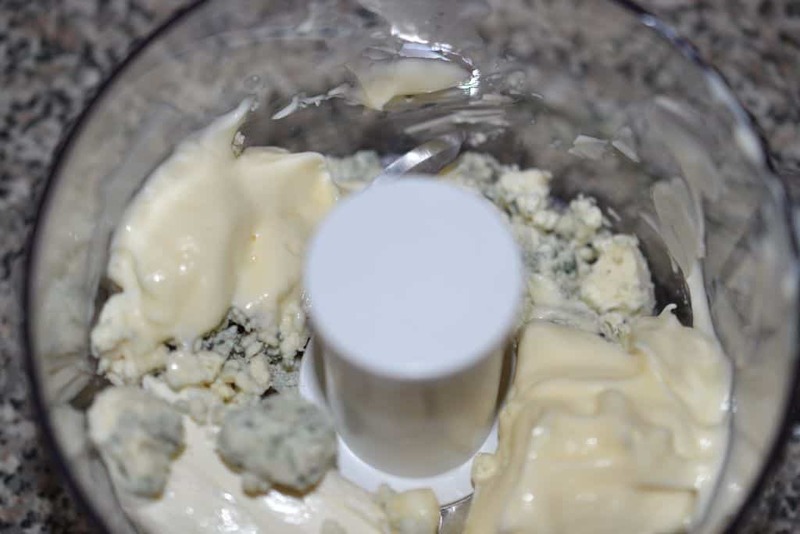 Combine the cream cheese, bleu cheese, mayo and hot chili sauce in a food processor and pulse a few times until well mixed. I used my mini food processor. 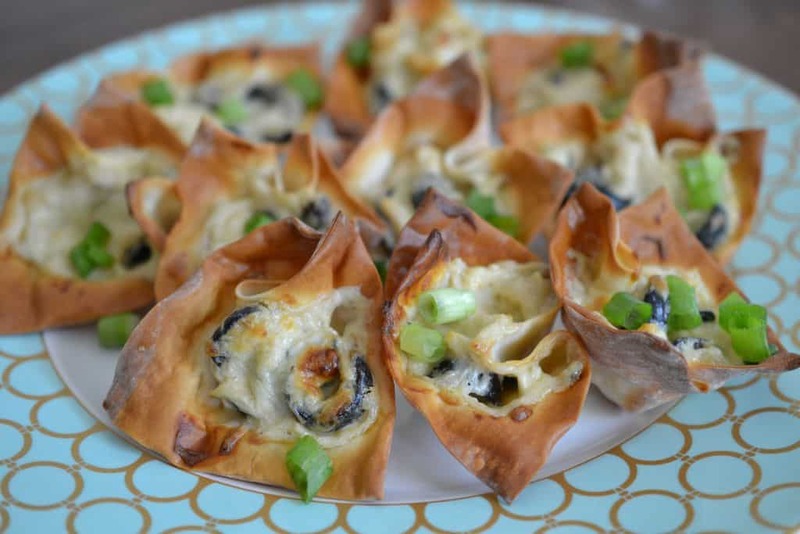 Fold in the chicken and black olives. If you don’t like black olives leave them out! 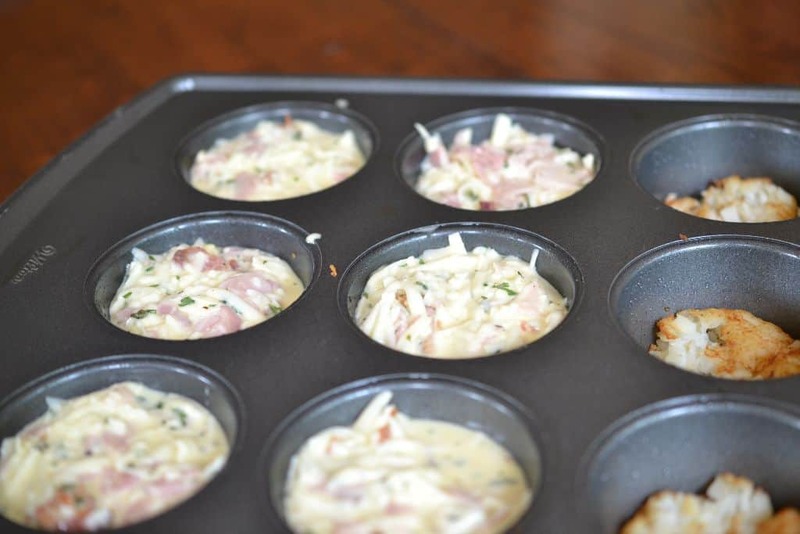 Gently press the wonton skins into your mini muffin pan. I see a pattern of minis going on here. Bake for five minutes. Take them out of oven, add the cheese mixture, bake for another seven minutes and sprinkle with the chopped green onion! 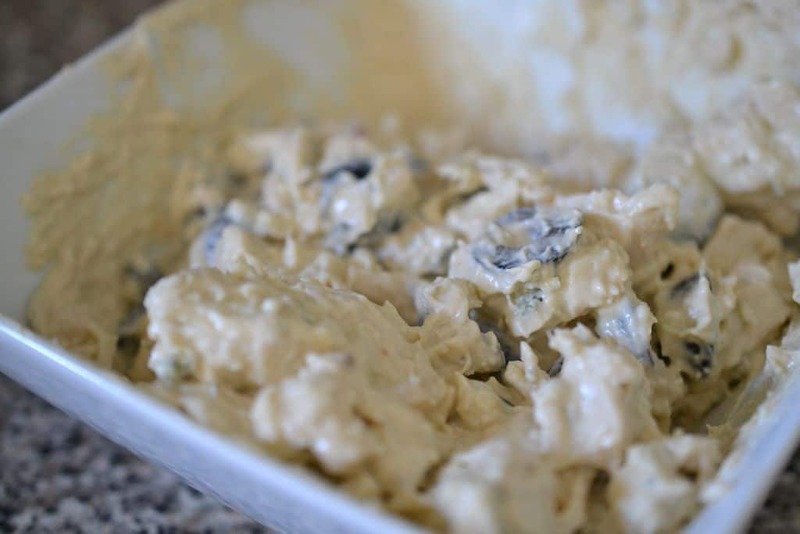 Mix cream cheese, bleu cheese, mayo, and hot sauce in food processor until well combined. 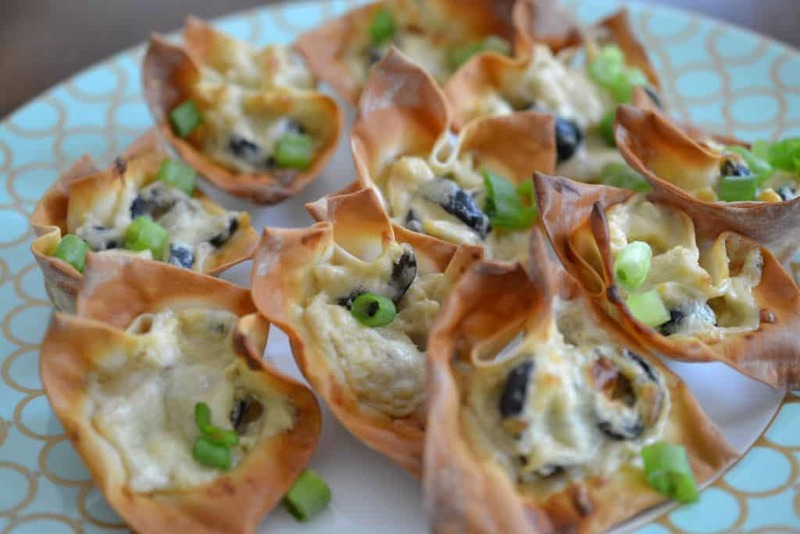 Fold in black olives and chicken. 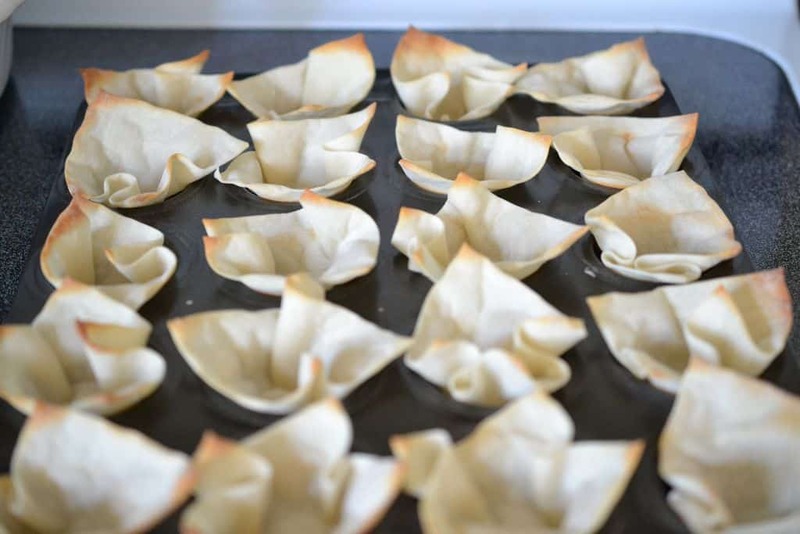 Gently press wonton skins in mini muffin pan. Bake at 350 degrees for five minutes. Remove from oven. Using a small spoon add cheese mixture to the center of the baked wontons. Bake an additional seven minutes at 350 degrees. Remove from oven and sprinkle on green onions. You may want to double this recipe as it makes about 30 wontons. They will go fast. If you don’t like black olives leave them out. I use my kitchen utility scissors to cut green onions. They are much easier than a knife. 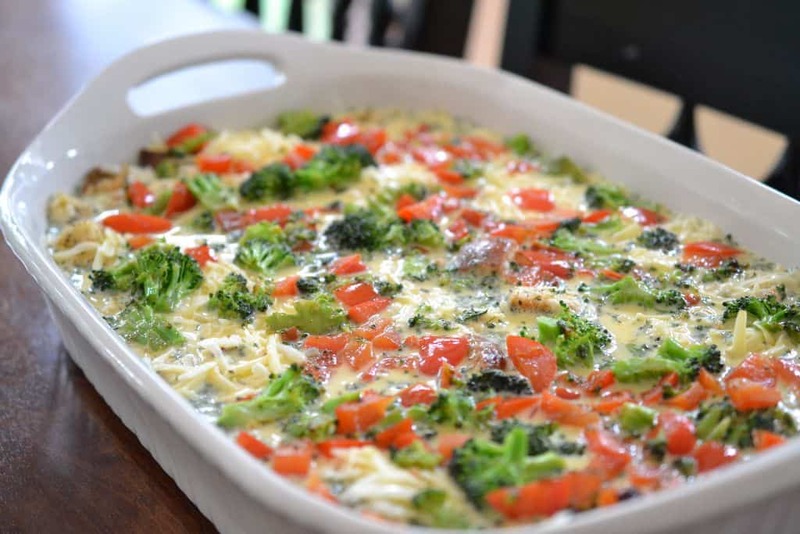 I love overnight egg casseroles. It is so nice to have something that smells wonderful baking in the morning while you are rushing around getting your chores done. Somehow it motivates me and keeps me moving. This one is real easy and tastes wonderful. Today I baked it for my office friends. 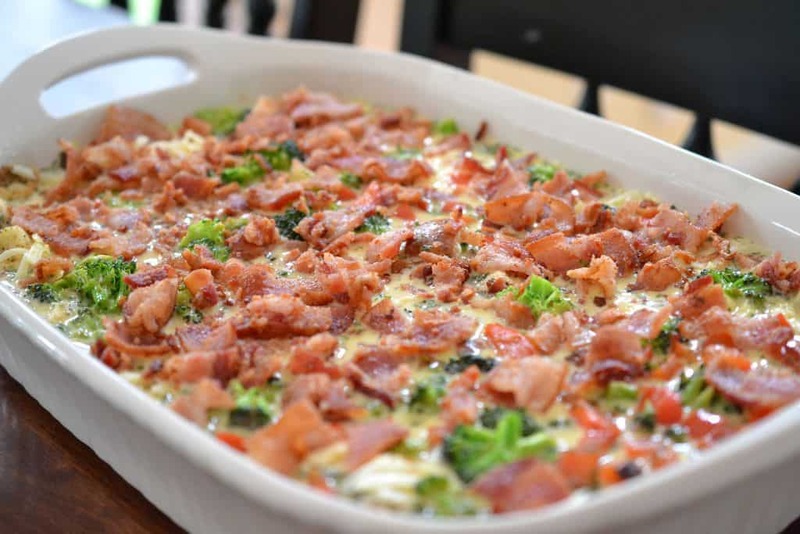 Just so you know the pictures of this casserole are for a double recipe. 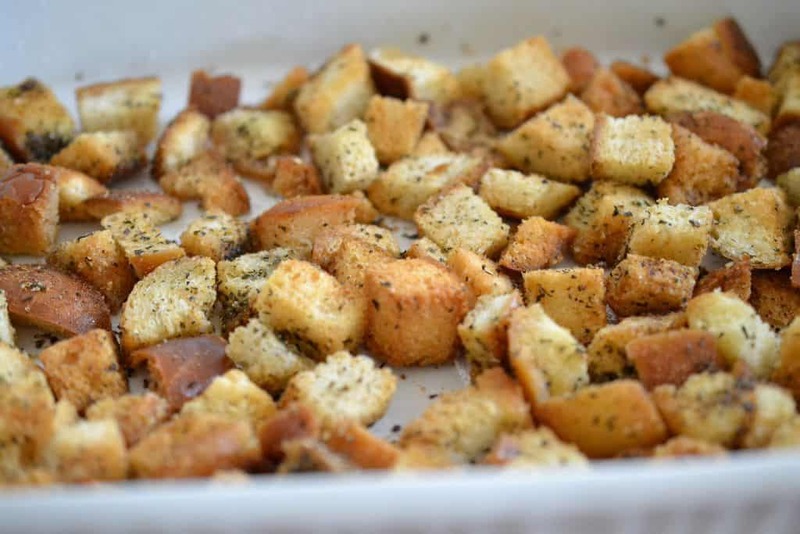 Place the croutons in a casserole dish sprayed with non stick spray….just to make it a little easier for cleaning. Be sure to use seasoned croutons. Cook the. 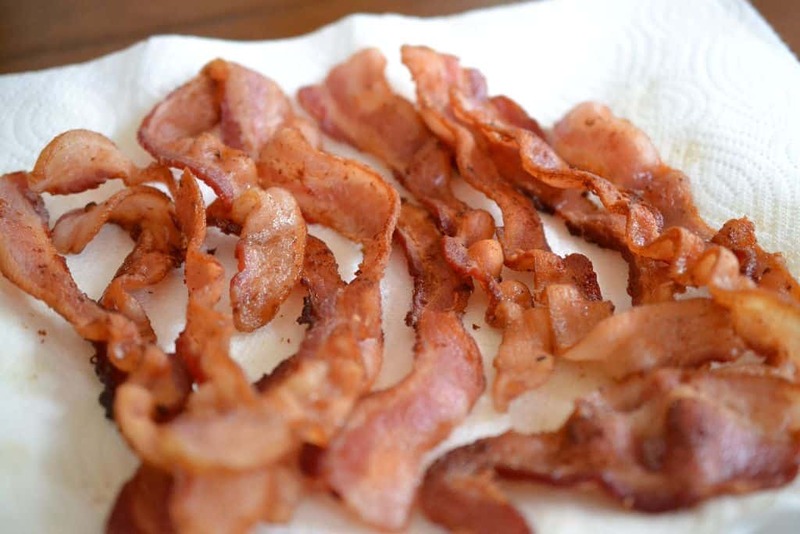 bacon until nice and crispy, drain on paper towels and chop it up. Though not too small as you want to be able to see it and taste it. 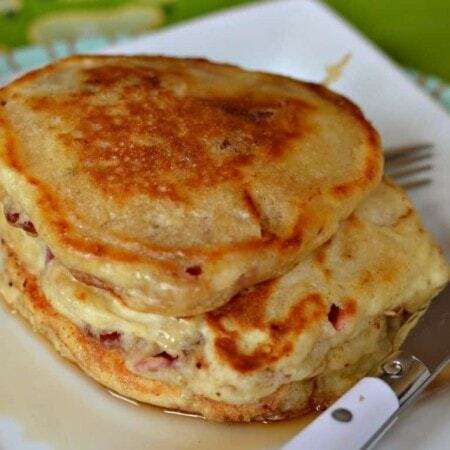 Leave one tablespoon of bacon grease in pan and remove from heat. You will back to it in just a few minutes. 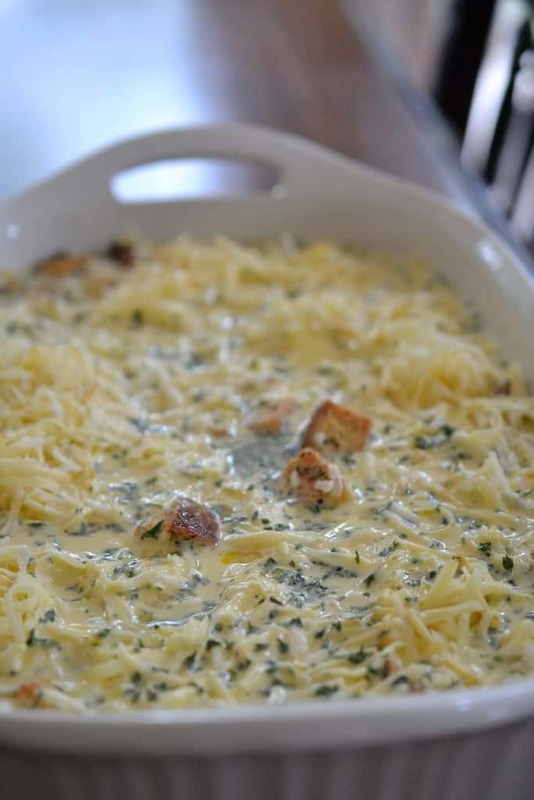 Grate the white cheddar cheese and the Gruyere cheese. I love cheese. Cheese goes with everything and I mean everything! 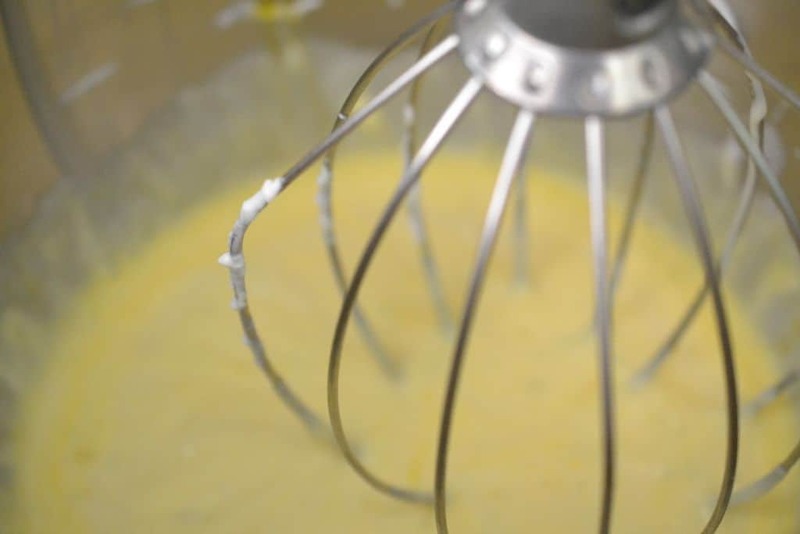 Mix eggs, milk, heavy cream, parsley and mustard in a large bowl and mix with a whisk. If you doubled the recipe it is going to require some muscle! 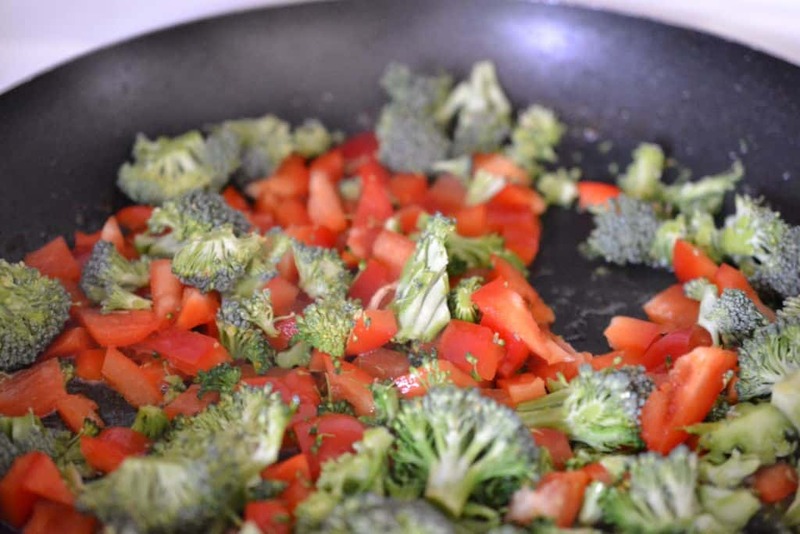 Saute the red pepper and broccoli in the same pan that you cooked the bacon in. Remember the one you left on the stove with a tablespoon of bacon grease. Cook on medium heat for about 3-4 minutes. Remove from heat and allow to cool while you push on. Stay calm and make the casserole! Put the grated cheese on top of the croutons and pour the egg mixture on top. Be sure to mix the cheeses as you put them in the dish. Add the red peppers and broccoli and lightly press into the egg mixture. Doesn’t this look wonderful. Enjoy! I know my office will love it! Yummy! Place the croutons in a 1 1/2 quart casserole dish sprayed with non stick spray. Cook the. bacon until nice and crispy, drain on paper towels and chop it up. Leave one tablespoon of bacon grease in pan and remove from heat. 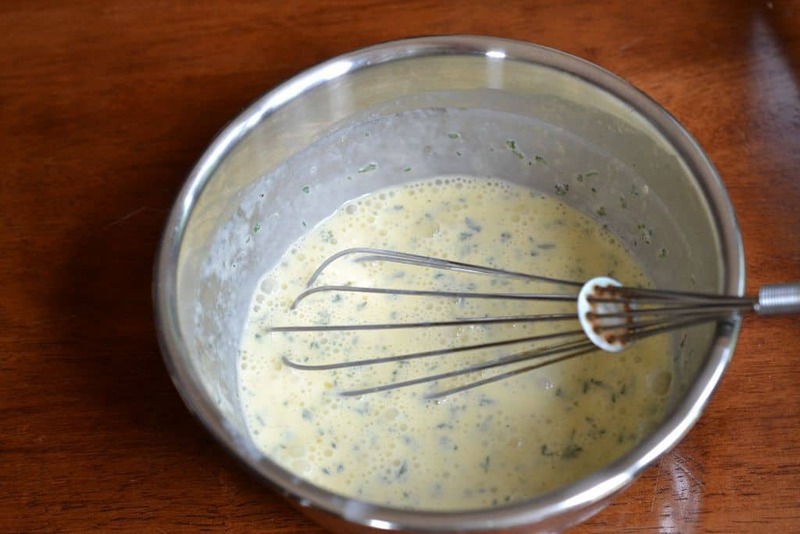 Combine eggs, milk, heavy cream, parsley and mustard in a large bowl and mix with a whisk. Saute the red pepper and broccoli in the same pan that you cooked the bacon in for about 3-4 minutes. Put the grated cheese on top of the croutons and pour the egg mixture on top. Be sure to mix both the cheeses as you put them in the dish. Add the red peppers and broccoli and lightly press into the egg mixture. 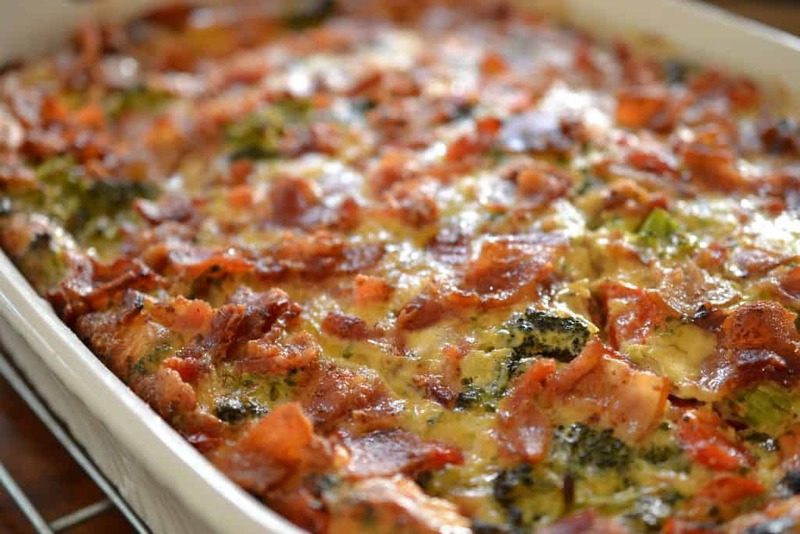 Add the bacon to the top of the casserole. Cover with plastic wrap and refrigerate overnight. Bake at 325 degrees for 50-60 minutes. The recipe as pictured was doubled for the office. 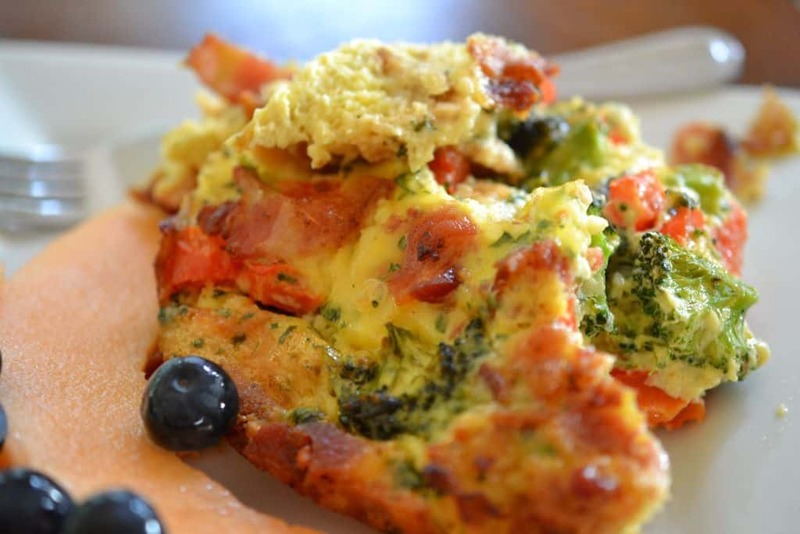 This is an easy peesy breakfast to prepare. It can be eaten on the go in a train and even on a plane . You will like it Sam I am! Prepare ahead of time by thawing out 24 tator tots for about 45 minutes to one hour. 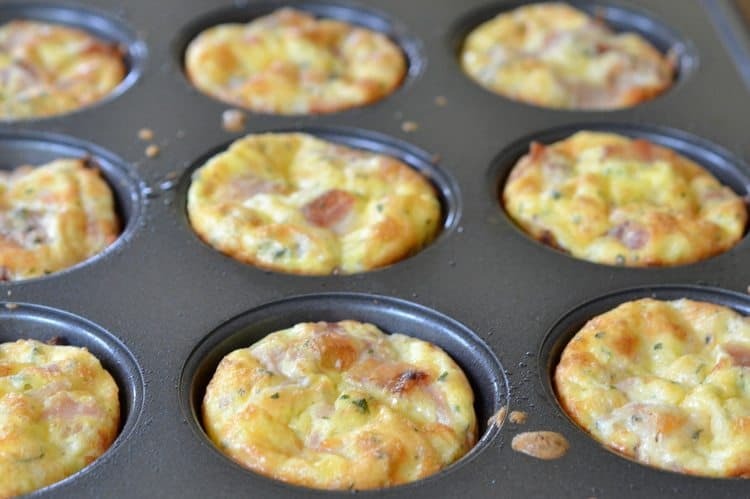 Spray a muffin pan lightly with canola oil or nonstick spray. Smoosh two tator tots in each muffin hole. Put in 375 degree preheated oven for 7 minutes. 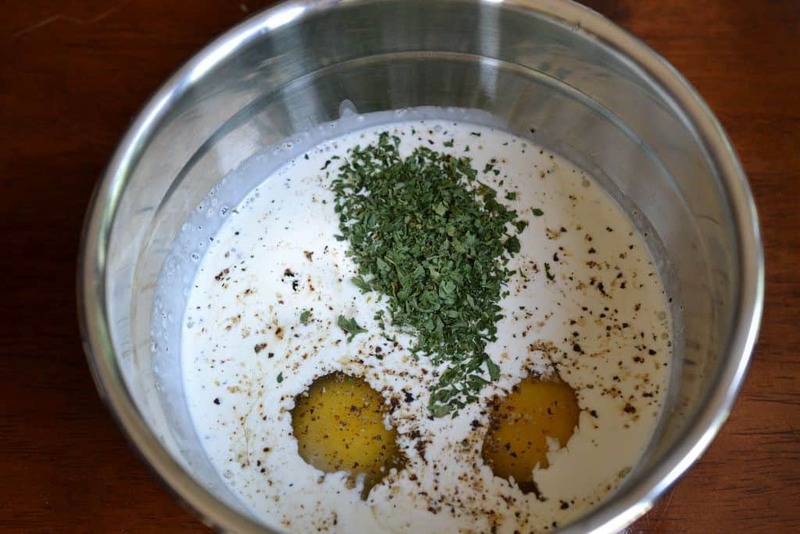 Place eggs, egg whites, black pepper, whipping cream, and parsley in a medium bowl. 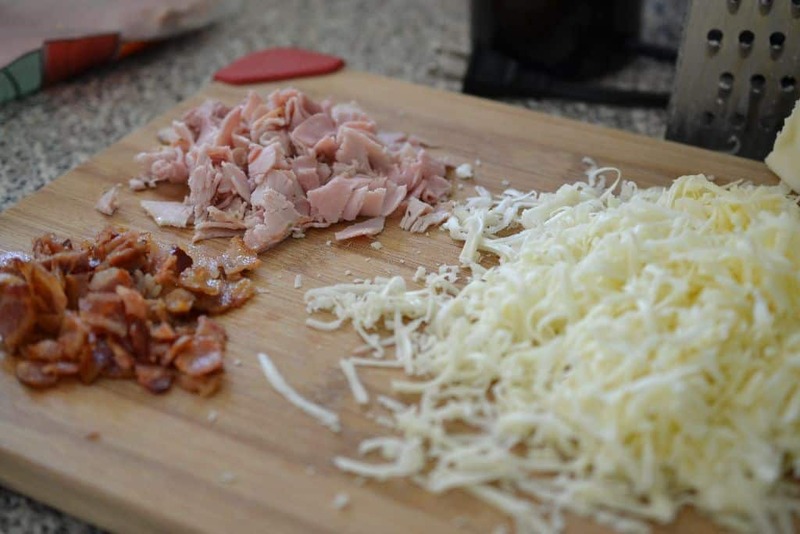 Add the ham, diced bacon, mozzarella cheese and white cheddar cheese to the egg mixture. Fold it in with a spatula! It will work much better than that whisk! 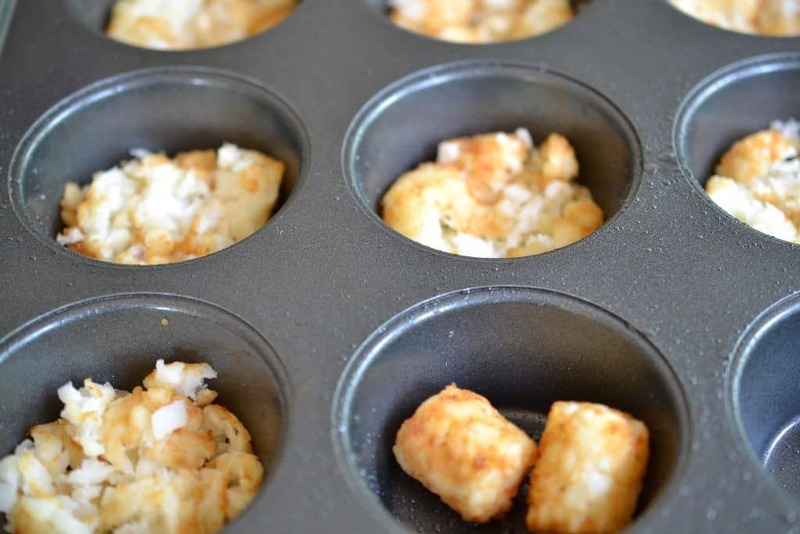 Ladle the egg mixture on top of the tator tots and place in the 375 degree preheated oven for twenty minutes. These look simply delicious and they taste even better than they look! 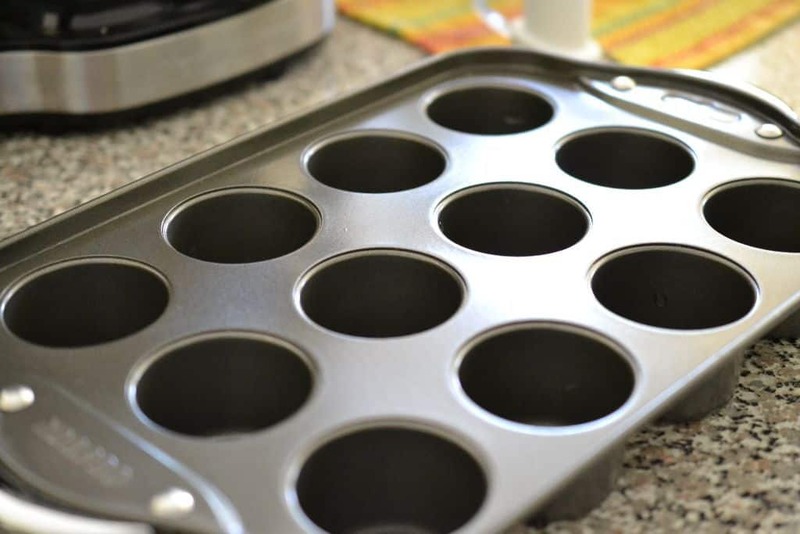 Grease 12 count standard size muffin pan with nonstick cooking spray or canola oil spray. Smoosh two tator tots in each muffin hole. Bake in 375 degree preheated oven for 7 minutes. 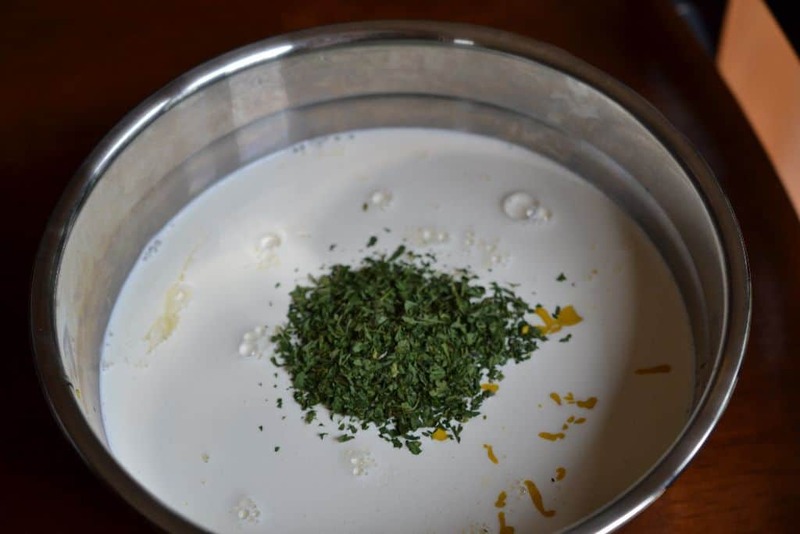 Mix eggs, egg whites, whipping cream, parsley and black pepper in medium size bowl with whisk. 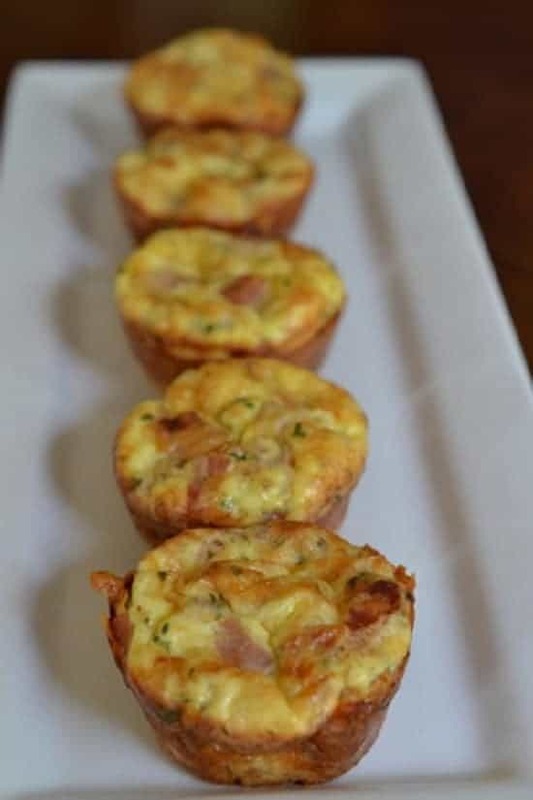 Fold in mozzarella, cheddar, ham and bacon. Ladle the mixture into the muffin holes leaving a little room at the top for rising. Bake in a 375 degree preheated oven for 20 minutes. 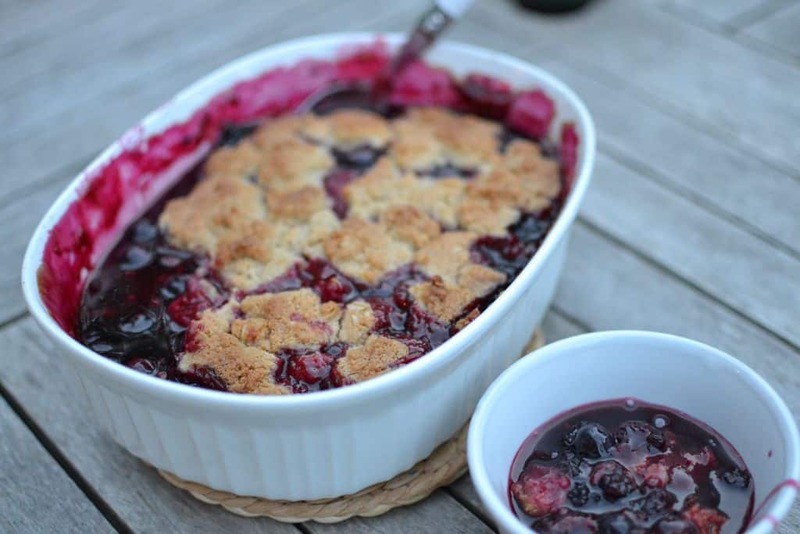 Summer has a lot of things to be thankful for and lots of delicious berries are just one of them. There is boating, swimming and fishing but lets get back to the berries. We have wild blackberries growing in our yard and boy do they have a lot of flavor. This is a really easy recipe to make. You can whip it up pretty quickly. I put this together on a weekday night and I am sure that you can too! 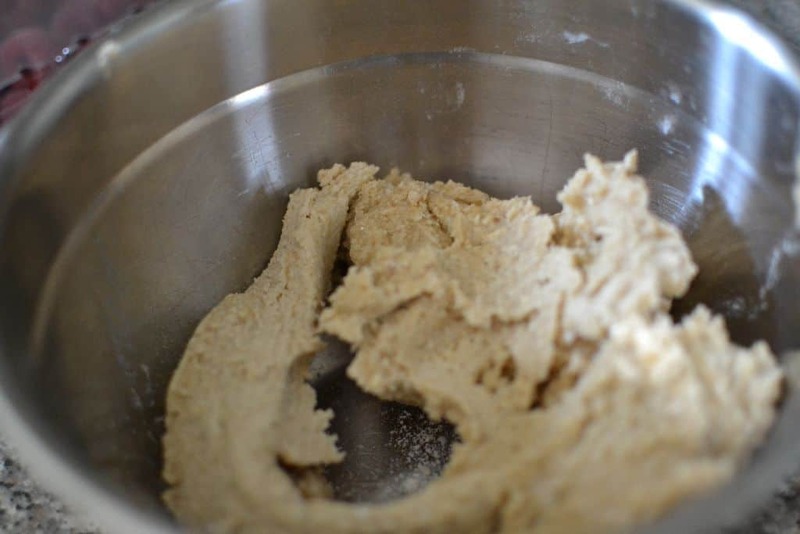 Pulse flour, brown sugar, salt, and ¾ cup oats in a food processor until blended. I used my mini food processor. 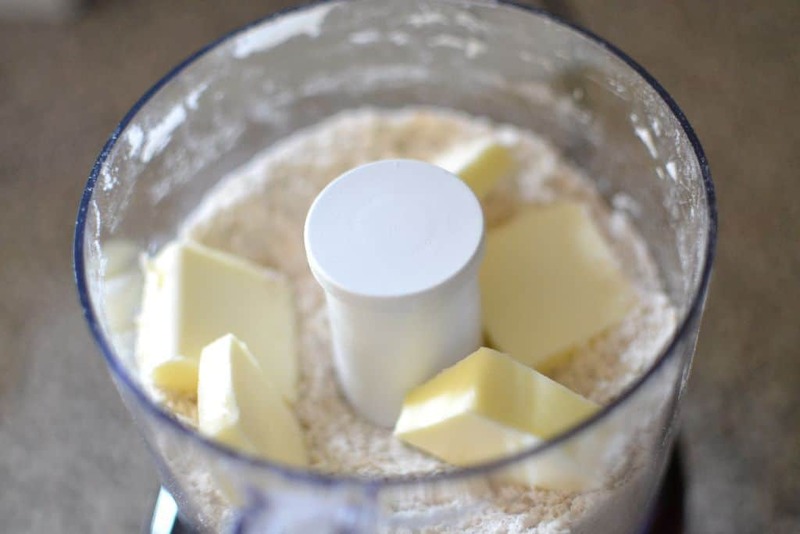 Add the butter to the food processor a few tablespoons at a time and pulse. When complete you should have a consistency like this…almost like cookie dough. Throw it in a bowl. Add the other 1/4 cup rolled oats. If you think you might like it just a little oatier add just a pinch more! I DID! Now take about ten cups of washed raspberries, blueberries and blackberries. I used some frozen blackberries and fresh blueberries and raspberries. We always have frozen blackberries here because they grow wild on our land. Add the sugar, cornstarch, lime juice and lime zest. 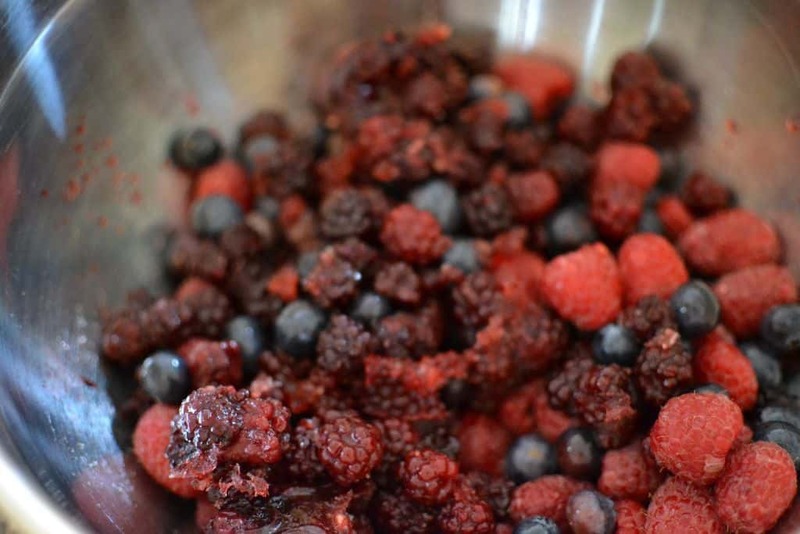 Mix to blend up but do it gently because berries are delicate fruit and you don’t want to end up with mush! 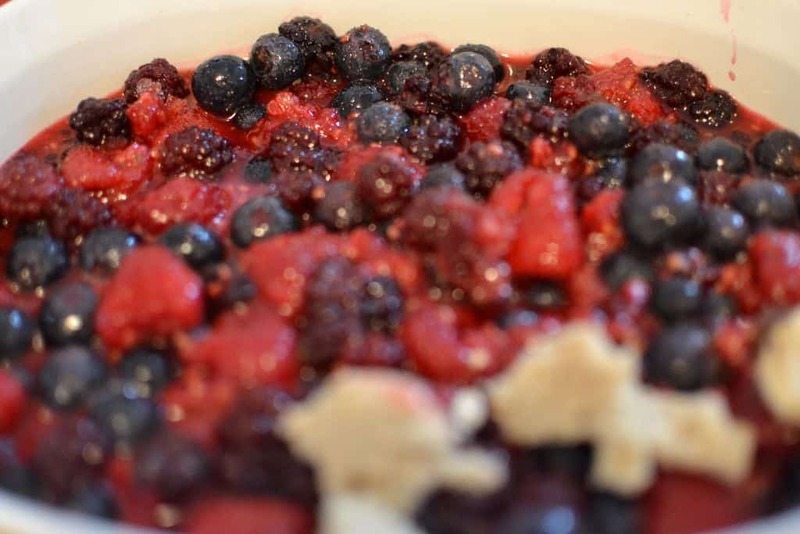 Put the berry mixture into a 1½-qt. casserole and drop your oat mixture on top in little spoonfuls. Bake at 375 degrees for 60 minutes. I hope you enjoy. It is a great way of sharing one of summers best treats! 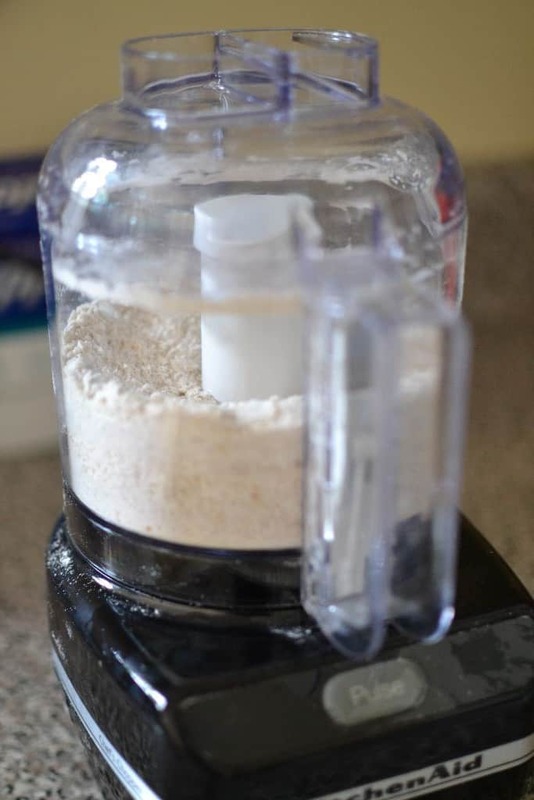 Pulse flour, brown sugar, salt, and ¾ cup oats in a food processor to blend. Pulse in butter a few tablespoons at a time until all is combined. 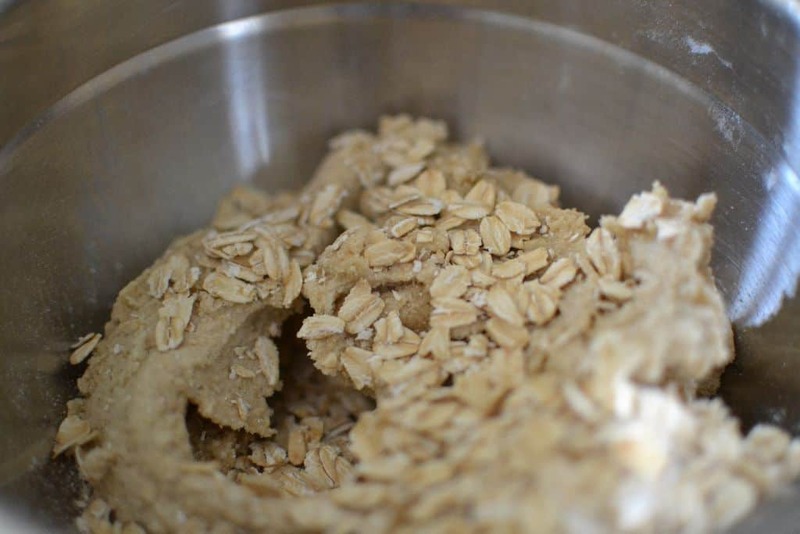 Transfer to a bowl and work in remaining ¼ cup oats with your fingers. 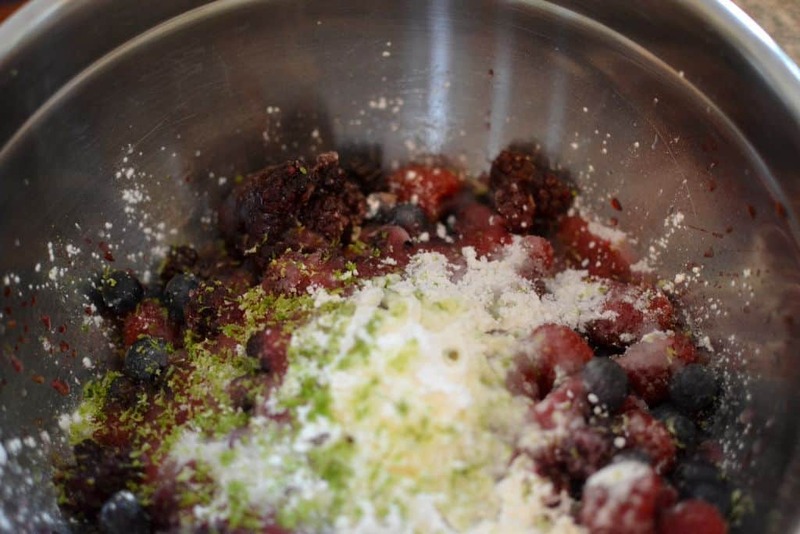 Gently toss the berries with sugar, cornstarch, lime zest and lime juice. Transfer mixture to a 1½-qt. baking dish. Scatter oat topping over with a small spoon, place on a baking sheet, and bake for 60 minutes. Transfer to a wire rack and let cool for 45 minutes.